The second adventure in the „Shadows over Riverton“-AP clocks in at 58 pages, 1 page front cover, 1 page editorial, 1 page SRD, 1 page back cover, leaving us with a massive 54 pages of content, so let’s take a look! This review was moved up in my reviewing queue due to me receiving a print copy of the book. You’re seeing the review this soon because I received the copy prior to release to the public and thus had ample time to analyze and test it. Now, before we dive into the meat of this adventure, let me talk a bit about the series: The author was one of the triad members of Living Greyhawk, and particularly involved with the Bandit Kingdoms. This module, in tone and spirit, thus breathes the legacy of Greyhawk, and indeed feels like a lost Greyhawk adventure with the serial numbers filed off. That is a good thing. The adventure takes place in the city of Riverton, the stage set in the first adventure of the series, and directly builds upon it – characters met and interacted with directly influence some of the proceedings and represent the main hooks. That being said, the adventure is VERY easy to adapt to other locales. As long as you can justify a humanoid slum (perhaps due to a lost war effort) in front of an otherwise more traditional city, you’re good. It should be noted that the Bandit Kingdoms-flavor that suffuses this adventure means that the town is grittier and somewhat more realistic than comparable settlements. Now, if you recall my review of the first adventure in the series, you’ll recall some components I loved: For example, Riverton gets settlement statblocks for EACH QUARTER. These, if relevant herein, have their modifiers hard-baked into the challenges. This is just one the various components, wherein this adventure sets itself apart from the majority of modules. The second, and most important aspect here, though, would be the obsessively, meticulous detail that is provided for the GM. PCs follow their employer after the quest, due to massive paranoia? There’s a scene that covers it. Need an encounter for one of the myriad gangs in the humanoid-slums? There’s an encounter for that. Unlike most published adventures, I can’t see this one requiring much in the way of GM-expansion o account for players going off the rails, which is even more interesting and remarkable, considering that this is a pretty free-form investigation/infiltration! Now, the adventure does another thing right that I really love: Rules-decisions, explanations and help for the GM is provided in a massive array of footnotes that further make handling the actual running of the module much, much easier. The adventure also sports a metric ton of statblocks, which render the challenges faced distinct and don’t leave you hanging dry when you’re looking for the stats of character xyz. This all conspires to make the adventure work in as much of a Go-Play-fashion as can be: While, being an investigation/infiltration and pretty free-form at that, the adventure works better (like all modules!) when you’ve read it prior to running it, but you won’t need to make many notes and GMs with at least a bit of experience under their belts should be able to run this without previously preparing it in detail. The adventure also presents an impressive array of read-aloud text, in vivid prose, bolds rules-relevant context so it’s easier to find (without violating formatting conventions)…and it eve sports an appendix, wherein effects of different lodging situations that the PCs find themselves in have significant mechanical aspects. The adventure also provides a handout. In short: This is one of the most convenient to run modules I’ve seen in a while, and its attention to detail is impressive and really helps to set the stage and maintain the atmosphere throughout: It generates a sense of reality, an impressive achievement. There is, for example, a magic item that most groups will not find. It is pretty cool and relevant for a powerful figure in town, though – the adventure even devotes time to the negotiation process regarding the figure and the item! In short: There is A LOT of care poured into this adventure, and it shows. All right, this is as far as I can go without diving deep into SPOILER-territory. Potential players should jump to the conclusion. All right, only GMs around? Great! So, it’s been a few days since the PCs arrived – enough to have their accommodations in Riverton have an impact on their well-being. The Halfling Stefania, an acquaintance of the PCs from module #1, contacts them to meet up at a tavern – and while this may sound like the oldest trope in the book, it provides a great example for the case I made regarding details. The module takes into account that PCs may show up early and scan the area; it covers the discussion of the task at hand with both read-aloud text and bullet points for conversation, skill-use, etc. – and if they unearthed the connection of the goblins from module #1 to the slavers in the slums, that also plays into the proceedings. Misty is acting on behalf of one of the most powerful NPCs in the city, who comes to meet them: None other than Misty Homeagain. Now, in another module, the proceedings would just boil down to a read-aloud text. Here, Misty uses a custom spell to provide a discreet means to converse (and paranoid PCs are taken into account) before talking to them – it’s a small thing, but it provides a rules-based foundation to discreet talks that adds a sense of realism and authenticity to the matter at hand. Heck, as mentioned before, paranoid PCs stalking Misty may be in for a thrashing – they’re small things, yes, but they add to the immersion, and this level of detail is maintained throughout the module. So, folks have been disappearing, and as the PCs found out in module #1, there may be a tunnel to provide egress to Riverton, past the corrupt, but at least nominally stringent guards. Thus, the mighty halfling wants the PCs to go to the humanoid slums before the city, to Beggartown, find the missing folks and rescue them. Sounds easy, right? Well, Beggartown is not a nice place to be – the rickety shantytown is characterized by lawlessness and the corrupt half-orc captain Llerdnig is one of the movers and shakers there. With orcs, tieflings, gnolls and goblins freely living there, some races like elves, dwarves, etc. may want to think about disguises. Nice: Stefania will accompany the PCs as a sort of GM-PC, and her input, well-meant, if not truly helpful, can help steer the PCs. If she does accompany them, they’d better make sure she gets out alive, though! Anyways, with incidents or without, the PCs enter Beggartown, where the trail does not really grow cold – instead, it becomes hot rather quickly, as the PCs are faced with a cool and diverse skill challenge/chase: The contact amidst all the squalor and misery of Beggartown seems to have just met his rather grisly end at the hands of gnolls, who see the PCs rather instantly, courtesy of Stefania. (Neat: This does help “sell” the chase as a not a railroad!) If the PCs succeed in catching up to the mottled gnolls, they’ll have a fight on their hands. But there is a pretty good chance the gnolls get away as well – so, how does the module handle that? Well, successful PCs can wring the location of the slaver compound from the gnolls, no problem…but if they failed…they don’t really have an issue. Clever PCs will note that the mottled fur only is sported by one of the gnoll tribes in Beggartown, a tidbit of information that clever GMs can seed…and even if the PCs know where the complex itself is, they’re left with more than one issue. You see, the tribe is rather sizable. To the point where assaulting the compound sans doing legwork is not a smart move. But if they haven’t managed to pinpoint its location, we have no problem either: You see, the compound obviously needs to purchase goods, right? Well, one means of thinning the opposition (and potentially secure an ally for a coup-d’état of sorts) is to ambush said team! There are plenty of other ways to help weaken the gnolls, provided the PCs can survive in Beggartown, that is – random encounters for all of the diverse gangs in town are provided…and, indeed, if the PCs are smart, they may even manage to take down the Alpha of the gnolls prior to assaulting the complex: Growl, the rather huge (size Large) leader of the gnolls likes to spar in the Chapel of Slaughter, the ramshackle fighting pit/neutral ground of Beggartown, and the module actually talks, in detail, about the process of becoming pit fighters and potentially stopping the brute. No mean feat, but if the PCs manage to achieve success there, they’ll have a demoralized tribe when faced with the folks who defeated their champion. Speaking of “Alpha” – where this, in another supplement, would have been just a moniker to denote the chieftain, here, we actually get a fully depicted hierarchy – and gnolls being gnolls, there is plenty of dissatisfaction and drama behind the scenes, including affairs and the like. Roleplaying savvy players may well be capable of destabilizing significant portions of the tribe before attacking the compound. Extensive notes on further development pertaining both success and defeat allow the GM to organically maintain the flow of the adventure. Oh, and guess what: Yes, the module accounts for the PCs buying the captives! Provided they have the funds, this would make for a smart move prior to attacking the compound, for example, as the PCs wouldn’t have to take care of the NPCs. Speaking of which: Hirelings and named NPC allies that have a stake in seeing the slaves freed may be recruited, and the adventure provides proper names, motivations and further adventure hooks for the slaves. Are you starting to see what I meant with “impressive details”? The assault on the compound, should the PCs choose to undertake it, is btw. not a singular rail-road-affair – there are chances for folks not being there, and day/night does matter as well. Heck, the respective shacks etc. get full game-mechanics, should your PCs choose to smash through them! This is a bit like having terrain that can be damaged in a videogame. While, in pen & paper, you theoretically have that all them time, but flimsy construction of the shacks makes it really relevant here! Having stats for the frickin’ structures makes the whole complex feel more dynamic, and before you ask, the compound is fully mapped in pretty detailed color maps. As a minor downside, these maps do not come with a key-less player-friendly version, which is a bit of a bummer, considering that it’s pretty likely that the PCs will capture a gnoll at one point. That being said, the gnolls are amazing – there are plenty of archetype’d and template characters here that deserve the moniker: There would be, for example, a venerable gnoll who has become slow in her old age, the flavor represented by drawbacks; a crippled gnoll s who dabbles in fire breathing and makes use of goblin skull bombs, nearsighted ole’ Stinky…these gnolls feel indeed like they have lived. While rank and file beings exist, it is ultimately in these NPCs that the tribe truly comes to life. I did mention an item, right? Really clever PCs may notice a magical shovel used near the trash pit, an unlikely treasure not identified by the gnolls – that would be the shovel of the final rest, which can yield PCs a nice financial windfall…if they don’t overly tax the goodwill of the guardian of the graves, that is. It should also be noted that XPs gained are contingent on more than enemies slain, so that’s another big plus as far as I’m concerned. Editing and formatting on a formal level are excellent – Casey Brown’s professional background and experience in editing is quite apparent here. I wish I was as good at editing my own writing! On a rules-language level, the adventure is similarly impressive – though slightly less so: When e.g. a caltrop-trap references “slicing” damage that should be “piercing.” That being said, the module is actually more precise than PFRPG’s base rules here – caltrops inflict RAW, in a nonsense-decision, untyped damage, which clearly should be “piercing.” So yeah, my nitpick pertains something that the module does better than the core rules. Here and there, I could nitpick some minor rules-language in new content, but never to the extent where it would constitute a proper issue. The copious amount of statblocks are solid as well – I attempted to reverse engineer and encountered no problems. The pdf comes fully bookmarked for your convenience. The print version is b/w and sports a nice, matte cover; if you’re familiar with Raging Swan Press’ PoD-books, it uses that type. The lack of player-friendly maps represents my only somewhat valid complaint on a formal level against this module. The pdf version comes with a copious amount of nested bookmarks that render navigation comfortable and painless. Casey Brown’s second foray to Riverton is amazing. It develops the strengths of his previous offerings and applies them vigorously to a module-type that is a) harder to pull off properly and b), wherein the application of this attention to detail is much, much harder. From a formal perspective, this is one of the easiest infiltration/investigation-sandboxes to run that I have ever read. So, it’s comfortable to run and provides plenty of gaming material as well. There is another type of old school, one that you only get to see rather rarely – because it is really, really hard to pull off. You see, I could sum up this module as “PCs rescue slaves from gnolls in a slum.” I wouldn’t be lying. It’s a basic premise. The module does not throw some central weirdness in your face, it does not use some over the top shenanigans to distract you from structural shortcomings. It doesn’t have to. It is my firm conviction that unpretentious, Greyhawk-style fantasy sans a ton of high-fantasy stuff, with grit and detail and grime, is extremely HARD. You can’t rely on a catchy pitch that will make folks go “OMG, zis iz teh awes000m1111oneone! !” and you always risk the danger of becoming generic, forgettable. In fact, only your prose, your ability to evoke a concise, living, breathing environment, is what separates you from a “been there-done that” type of experience. You have to work in the small aspects, and when you botch the job, you’ll probably get a “soso”-review that can’t put the finger on *why* they were not engaged. That type of writing is HARD to pull off, very, very hard. Few publishers and authors manage to hit this precarious balance, this elusive sweet spot, with e.g. 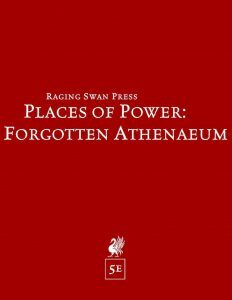 Raging Swan Press coming to mind as one of the few publishers that do. You may have realized it by now: This module manages to hit the right mood right on the head. And it, in passing, serves as a perfect rebuke to the claim that complex systems like Pathfinder can’t do this tone. The module uses a TON of material from Pathfinder’s extensive mechanics to enhance the mood that is conveyed in the adventure, to underline the realities of the game-world. It represents an impressive synthesis of mechanics and flavor, all in the service of storytelling. Why should you care? Simple. Because we frankly need more adventures like this. Because this atmosphere, this feeling, is precarious, hard to get right, and because, even if you prefer far out concepts, the weird ultimately does become stale if you constantly barrage the players with it. The wisdom inherent in this type of old-school sensibility is, that in order for the outré and fantastic to properly work, you have to ground it, contextualize it. And that is much harder than writing an adventure about 8-armed flying monkey/mi-go-hybrids with laser canons. See what I did there? I bet you thought “that sounds cool” – see, that is the elevator pitch I mentioned. I can’t do the same type of elevator pitch for this module. Don’t get me wrong. I love far-out weirdness. But know what? Chances are, that if you buy this module (the price-point is btw. imho really, really low for the amount of material), you’ll start smiling upon reading the module. Because it draws you in. Because it feels alive and organic and plausible. Because it doesn’t rely on flash and bang and world-ending threats, instead opting for a more subdued theme – without becoming generic. It is interesting, once you start to think about it, that strange and weird concepts and high fantasy over-the-top superhero-esque gaming have become so prevalent that fantasy like this, grounded, grimy, and down-to-earth, has become fresh, unique, and a rare and treasured type of experience. I do get why, mind you – in the hands of a mediocre author/designer, this would have been boring. It’s not. Missed the first one? There’s a bungle here on OBS! The seventh installment of the OSR-‚zine „The Manor“ clocks in at 27 pages, 1 page front cover, 2 pages editorial/ToC/introduction, 1 page advertisement, leaving us with 24 pages of content, laid out in 6’’ by 9’’-booklet style. 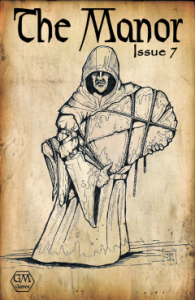 The book sees the return of one of my favorite series from the early installments of the ‘zine, with Boltswitch’s Mobile Potion Emporium, penned by Boric Glanduum. The eponymous Boltswitch is basically a gnome snake-oil salesman, but one whose potions actually do something! Granted, not necessarily what you *want* them to do, but Boltswitch seems to be pretty up front about minor…peculiarities. Adak’s essence of age, for example, seems to be duplicating haste, but for briefer periods…and it eats up your lifespan. The unique component of this article would be that it is system neutral…and it is penned wholly in character. Boltswitch’s descriptions of his unique potions, his sales-pitches and the like, are really nice and useful, helping the referee/GM get into character. Particularly if you’re not that good with text-improvisation, having an extensive array of comments to paraphrase should be rather helpful. On the downside, while the text does an impressive job at conveying the benefits and drawbacks of the potions sold, the lack of precise effects for them feels unnecessary. Considering the brevity of rules-text that good OSR-mechanics can take up, it would have been nice to get a page of actual, mechanical benefits here. The second article is penned by Joshua De Santo and introduces the skinwalker (coyote) class: Prime attributes would be Dex and Wis 13+ (with the customary 5% experience bonus) and HD are 1d4s. Skinwalkers are restricted to leather or chain armor and may not use shields. Weapon-wise, they are restricted to daggers or longbows – the latter restriction is a bit weird. Why not shortbows as well? Skinwalkers need to be neutral. Skinwalkers get low light vision, which is somewhat odd, considering how most OSR-rulesets know darkvision, infravision or x-ray vision, with low-light vision being something you see in more recent and rules-heavy systems. At 1st level, the skinwalker can change to coyote form and back once per day, +1/day at 3rd level and every 3 levels thereafter. Okay, question: Is that always the same coyote form or can he assume different coyote forms? The skinwalker can use thief skills like a thief of one level below his character level. This should probably be gained at 2nd level, since 0-level characters usually have no thief skills. At 2nd level, skinwalkers get +2 to rolls to determine whether a person is lying to them. This is…kinda weird, since most commonly-used OSR-games do not roll for the like, using roleplaying instead. This makes the ability somewhat…useless sin quite a few systems. At 6th level, the skinwalker can produce minor glamors, such as changing color on herself or the target. No range, duration, save or limitation is provided. Saving throws improve from 16 to 7 and the class gains the first level at 2,500 XP, doubling required XP until 40K (4th level), whereafter we have a 20K per level requirement until 8th level – thereafter, it’s 50K per level. I do not like this class one bit. It feels like an attempt to design for 5e that was aborted mid-way and jammed into OSR-games. The potentially interesting abilities are left to the referee to codify, which feels somewhat lazy. Chris Coski has probably read about fabled Thuzun Thune: In a system-neutral article, we are presented with no less than 8 different magic mirrors, as well as quite a few really nice b/w-artworks. The article introduces such gems as the mirror of mediocrity or the mirror of mortis, which shows one of the myriad, gruesome way in which the viewer may die. I loved this article! It is pretty damn cool and authors that plan on jamming the oomphteenth mirror of opposition into their modules should take heed! That being said, I wished we got stats for them as well. Beyond a funny mind-flayer haiku, we also have a micro-adventure by Simon Forster: One page map, one page explanation…and it can actually become pretty lethal pretty fast and sports stats for the BBEG, which are system agnostic, yet precise enough to use them smoothly! Kudos! Now, this installment also sports a full-blown adventure, the Horrid Caves, penned by Garrison James, intended for 1st or 2nd level characters. Difficulty-wise, I’d consider the module to be hard – it definitely requires a well-rounded group. While I’m not the biggest fan of the font used, the adventure is a highlight – not just for this issue of the ‘zine, but for its whole run! I am NOT exaggerating! You see, it actually comes with no less than 7 new, precise and meticulously crafted spells, it also sports a summon-chart for one encounter and an extensive random encounter chart. Formatting here is precise as well – italicized spells, ascending and descending AC, precise rules…and a ton of unique monsters, which include flammable vermin that take more damage by fire, but also become ridiculously fast while ablaze. Even cooler: The strange ecology of the caverns makes sense – clever players are rewarded for observing how the weird fauna interacts with each other. Better yet: The module is really versatile: It can easily fit into traditional fantasy, into weird fantasy, or work just as well in a post-apocalyptic context or in a Sword & Sorcery world – more on that below. It also has a distinct vibe that DCC judges will most assuredly love. Okay, from here on, SPOILERS reign. Potential players should jump ahead to the conclusion. Once upon a time, an inhuman warlord and his crustacean soldiers from another plane were cut off from their means to return; separated from their spawning pools, these beings arrayed themselves in formation for the death to come, as they would for battle – and now, their caves have been breached. In the caverns, strange tadpoles levitate through the skies, only to explode upon death; a severed, undead head makes for a formidable spellcaster and the undead husks of chitin-creatures shamble through the complex, potentially leaving strange seeds behind. Tubular snails spew blinding fumes, and lime-green spiders…actually are mostly harmless for PCs, but can color the skin of their bites temporarily lime green. Hooray for mammals being for once not subject to all poisons. Of course, these spiders can collapse into green slime. Which is very much deadly for mammals. But hey, it takes a bit of time and doesn’t happen always…so don’t chuckle to hard in advance… A twisted idol can temporarily grant supernatural fecundity, though offspring born with have a crayfish-like face. Hexagonal blue-green-glazed tiles contain spells that fortified against the then-cutting edge bronze weaponry, and magic-users can learn to leave organic, semi-permeable membranes in their wake. There also is a spell to target gills in particular, which may be of more use than at first glance. A primordial ancestor of black puddings, the black oil, slimes away in a recess of the dungeon, and a snail-pearl may be valuable…but while in the complex, it has a nasty habit of summoning giant, carnivorous snails! Oh, have I mentioned the ancient, magical paintings of a time long gone? This adventure is mechanically-precise, has a cool map, and can fit into a ton of different games. It also represents a challenging, fun and amazing adventure. It warrants the low and fair asking price pretty much on its own. Editing and formatting oscillate a bit between articles regarding their quality, but can generally be considered to be good when seen as a whole. Layout adheres to a 1-column b/w-standard, with a surprising amount of nice b/w-artworks I haven’t seen before. Cartography is b/w and similarly nice, though, alas, we do not get player-friendly, key-less versions of the maps. The pdf comes fully bookmarked for your convenience. The 7th installment of the Manor represents, in a way, a highlight in the ‘zine’s run: The system neutral articles are both inspiring, if held back a bit due to their lack of precise rules. The micro-dungeon represents a surprisingly fun diversion as well. The class, on the other hand, alas, falls short of what it easily could have and should have been. Just because something’s written for a rules-lite OSR-game doesn’t mean that the rules get to be shoddy – precision is key and NOT anathema to flavor – see e.g. Gavin Norman’s phenomenal work, for example. And then, there would be “Horrid Caves.” This dungeon is frickin’ amazing and warrants the price of the magazine all on its own. It’s precise, well-crafted and simply elegant, super-easy to integrate into a ton of different genres…I can’t say enough good things about this adventure. It’s a real gem. Anyways, rating-wise, I have to rate the issue as a whole, and while it is one of my favorite installments of the whole ‘zine, as a whole, it falls slightly short of getting my seal of approval, with more articles falling into the “good, but not great”-range. Still, I highly recommend picking this one up – $2.50 is a true steal for the content herein. Hence, my final verdict will be 5 stars, in spite of a few rough patches here and there. You can get this ‘zine for a mere $2.50 here on OBS! An interesting facet of this exile is obvious to anyone who starts to think about it: The place makes for a great place to store heretical texts, forbidden and obscure knowledge and the like – whatever the powers-that-be want purged from records, Erasmus the bibliognost may intervene to procure and conserve the knowledge. This, obviously, means that this place makes for an excellent destination for PCs, are we all know how likely it is that they will need notes on unintentionally unleashed doomsday devices, magical diseases, planar configurations, etc. As such, the knowledge pertaining the place is relatively obscure, something that should be borne in mind by referees, and the librarians that maintain the place are a relatively eclectic lot, unified by dressing habits and appearances, in spite of their diverse worlds and planes of origin. This is as well a place as any to note that the classes referenced have been properly adjusted to reflect the preferred designations of old-school gamers: Magis-users, thieves, etc. can be found in these classes referenced. The supplement details the daily proceedings in the athenaeum, painting a concise picture of daily life and circumstances, as well as on how to get PCs actually to it, how these beings are introduced to the place, etc. 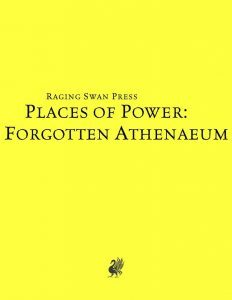 As always with Raging Swan Press’ supplements, the pdf does contain 6 whispers and rumors and 6 sample events to kick off adventuring, though it should be noted that, in this instance, they are applied globally to the athenaeum, not to the individual keyed locations, of which there are 12, many of which provide their own angles as well, though they are not explicitly noted as hooks. The respective keyed locales do not have read-aloud text provided for them. The place btw. also includes a rather impressive, eternal garden…which is a fragile treasure, since the plane’s timelessness does prevent regrowth of new plants, fruits, flowers, etc. As an aside, this, to me, makes the garden utterly creepy. The astute reader will notice a few peculiarities here: One, the existence of the two cultures is thankfully, courtesy of the planar angle, not required to use this pdf. This is SMART, since jamming two cultures into the lore of a given campaign setting, just so the background checks out, is something I hate. The astute reader will also have noticed that the Astral Plane chosen as the location is timeless – and indeed, the pdf actually integrates this component into lore and structure of the place of power, which is a pretty big plus – so far, so nice! Now, this being the system neutral version, I obviously have nothing regarding research-mechanics to complain about. The pdf is also careful to make sure that references to spells have been properly adjusted to refer to the respective, classic monikers, so yeah – well done. Editing and formatting are very good, I noticed no serious hiccups. Layout adheres to Raging Swan Press’ printer-friendly two-column b/w-standard and the pdf sports a few neat b/w-artworks. The cartography by Dyson Logos is nice and the pdf comes fully bookmarked for your convenience. It also comes in 2 versions, with one optimized for screen-use and one optimized for the printing process. Kudos! Richard Green makes clever use of the planar properties of the astral plane for this refuge of uncomfortable truths and heresies. The place is clever, easy to integrate into a given campaign, and while I slightly bemoan how much text is spent on its genesis, I can see the necessity. This place, in short, is a really cool sidetrek/goal-destination that can make PCs enter an otherwise unrelated dungeon: There’s an entry there, go! Easy angle to implement. So yeah, this aspect is rather cool. The system neutral version of this place, to me, is the best one – both PFRPG and 5e-versions, to one degree or another, offer only a very simplistic benefit for consulting the library, which may feel anticlimactic. Since this version eschews mechanics for the like, it is also, ultimately, the version against which I can field no viable gripes. The conversion is solid and thorough, and thus, my final verdict will clock in at 5 stars for this iteration. You can get this neat location here on OBS! As such, the knowledge pertaining the place is relatively obscure, particularly in 5e – the lore-DCs are pretty damn high, which, in this case, is a good thing as far as I’m concerned. The librarians that maintain the place are a relatively eclectic lot, unified by dressing habits and appearances, in spite of their diverse worlds and planes of origin. The supplement details the daily proceedings in the athenaeum, painting a concise picture of daily life and circumstances, as well as on how to get PCs actually to it, how these beings are introduced to the place, etc. In the 5e-version, the research bonuses conveyed by the library are translated into Intelligence checks made at advantage, with +2 to the check if the knowledge sought is banned/heretical. I’m good with that, though I wished that the rules specified how this interacts with features that already net a character advantage on such a check. References to NPCs have been redesigned properly to point towards the respective default NPC-stats 5e employs. Richard Green makes clever use of the planar properties of the astral plane for this refuge of uncomfortable truths and heresies. The place is clever, easy to integrate into a given campaign, and while I slightly bemoan how much text is spent on its genesis, I can see the necessity. This place, in short, is a really cool sidetrek/goal-destination that can make PCs enter an otherwise unrelated dungeon: There’s an entry there, go! Easy angle to implement. So yeah, this aspect is rather cool. The 5e version of this supplement works smoother than the PFRPG-iteration, courtesy of the lack of a unified research rules-array in 5e. That being said, if you’re REALLY stingy about 5e’s peculiarities, you may object to a druid having an owl animal companion, for example – this is only mentioned in the flavor text, but yeah. Some of you may object to that. All in all, I consider the 5e-version to be slightly stronger than the PFRPG version, which is why my final verdict will clock in at 4.5 stars, rounded down for the purpose of this platform. You can get this library here on OBS! As such, the knowledge pertaining the place is relatively obscure and the librarians that maintain the place are a relatively eclectic lot, unified by dressing habits and appearances, in spite of their diverse worlds and planes of origin. The supplement details the daily proceedings in the athenaeum, painting a concise picture of daily life and circumstances, as well as on how to get PCs actually to it, how these beings are introduced to the place, etc. Now, there is one thing that I particularly bemoaned regarding the locale as presented: RAW, it yields a bonus to Knowledge checks (+4/+6, respectively) to research materials. Which is all fine and dandy, however, Ultimate Intrigue did introduce rather nice and compelling rules for research, and it would have been really nice to see those implemented, at least in a sidebar or the like. Richard Green makes clever use of the planar properties of the astral plane for this refuge of uncomfortable truths and heresies. The place is clever, easy to integrate into a given campaign, and while I slightly bemoan how much text is spent on its genesis, I can see the necessity. This place, in short, is a really cool sidetrek/goal-destination that can make PCs enter an otherwise unrelated dungeon: There’s an entry there, go! Easy angle to implement. So yeah, this aspect is rather cool. That being said, I do not object to the relatively rules-lite way in which the benefits of the library are presented, but implementing research rules/library stats would have added to the immediate functionality of this pdf for its PFRPG version. As such, while I really enjoy the location, I am slightly less smitten by the execution for this system. My final verdict can thus not exceed 4 stars. This massive, crunchy hardcover clocks in at 170 pages, 1 page front cover, 1 page editorial, 1 page introduction, 1 page ToC, 3 pages of advertisement, 1 page SRD, 1 page back cover, leaving us with 161 pages of content, so let’s take a look! This review was moved up in my reviewing queue due to me receiving the limited edition print version of this book. My review is mainly based on this version, though I have also contacted the pdf to ascertain the functionality of that version. It was also requested as a priority review. Now, first of all: This review is a HUGE monster, intended to help you ascertain for yourself the content. 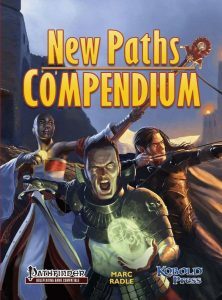 Wait, didn’t I already review the New Paths Compendium? Well yeah, I did. I also covered all previously released installments of the New Paths-series released since then and analyzed them in depth. However, this book not only represents a sort of final version for them, it also contains new content. Plus, Pathfinder has changed, often quite significantly, since the release of the initial releases, so revisiting the material and analyzing how it holds up will be one of the goals here. Now, I cannot go into the really deep level of detail for a book of this size sans bloating the review beyond any usefulness – I will focus more on the big components, i.e. on the classes and supplemental material that make up the majority of the book. All right, so we begin with no less than 12 different new base classes. The first of these that I’d like to cover would be an oldie-but-goldie, the spell-less ranger. The spell-less ranger gets full BAB, d10 HD, 6+Int skills per level, good Fort- and Ref-saves, up to 5 favored enemies, up to 4 favored terrains and additionally stealth attack which is a terrain/favored enemy-based, weaker variant of sneak attack that is gained at 2nd level and scales up to +5d6, increasing by +1d6 every 4 levels thereafter. Hunter’s bond with allies or companion (from a limited list) is chosen at 4th level. Staples like track and wild empathy at 1st, combat style at 2nd level and endurance at 3rd level are provided. 5th level and 12th increase base movement rate in favored terrain by +10 ft. each and 7th level nets woodland stride, 8th swift tracker and 9th evasion. Quarry is gained at 11th level, camouflage at 12th, improved evasion at 16th, hide in plain sight at 17th and improved quarry at 19th level. The capstone nets full-speed following tracks as well as a standard action attack versus favored enemies that prompts a save-or-die. The death strike ability component may be used 1/day versus each favored enemy, but not more than once per target – this is important, since there may be overlaps. The class gets some unique tricks as well, with 3rd level providing the means to use Heal for expanded, medicinal purposes, and the class gets further customization tricks in the guise of ranger talents at 4th, 7th, 9th,11th,13th, 16th and 19th level. These include low-light vision, combat feats, treating difficult terrain in favored terrain as normal, +4 to confirmation rolls to confirm critical hits, ignoring concealment with a standard action ranged attack or gaining an additional animal companion. These are potent, but they have to be to make up for the loss of spellcasting. The spell-less ranger features 3 archetypes: Companion-bound rangers do not suffer from the restrictions regarding companion choices of the regular spell-less ranger. However, to make up for this, the spell-less ranger only gets a single favored terrain, which limits the usefulness of some of the more potent talents and stealth attack. To avoid cheesing the better companion selection, the talent that nets an additional companion is expressively prohibited for the archetype. Instead of woodland stride, we get feat-based companion-enhancement and quarry and its improved version is modified to apply to the companion as well. Empathic link is gained at 12th level, The dual-style ranger only gets a single favored enemy, but gains, surprise, two styles. The shadow stalker replaces favored enemy with studied target and may combine it with stealth attack as an immediate action. Instead of wild empathy, we get poison use. 7th level replaces woodland stride with the option to study a target as a full-round action and then follow the studying with a potentially deadly attack, assassin style. This is very potent and may not be for all campaigns, as it makes the game a bit grittier and works well in a more savage/brutal type of fantasy. The reason why I’m not up in arms regarding this ability is that is it kept in check by only being able to target a given character 1/day – after that, it’s 24 hours immune to the attack. As an aside: This archetype makes for a really good solo-play class. One of the other classes presented herein is very much akin to the spell-less ranger, to the point where it can be considered to be a variant class of it. This would be the skin-changer. The skin-changer begins play with minor animal shape, which duplicates beast shape I, usable as a standard action and lasting 10 minutes per class level. This upgrades at 4th level and unlocks new size categories at 6th and 8th level, with 6th level and every 2 levels thereafter yielding an additional daily use. 10th level unlocks healing whenever forms are changed, which similarly scales, and 12th level nets DR in animal form. Changing action economy also improves. 3rd level nets speak with animals at-will in favored terrain, and 2nd level nets animal combat, which translates to bonuses for natural attacks and damage, as well as initiative in animal form. These improve, and over the levels, the natural attacks also count as progressively better for bypassing DR, with 8th level yielding Critical Focus, 11th Bleeding Critical and 14th Improved Natural Attack. The class gets 4 favored terrains and stealth attack is gained at 6th level at +2d6, improving by +1d6 for every 4 levels thereafter. No hunter’s bond is gained and 15th level nets +3 natural armor in animal form, which increases by +2 at 17th and 19th level. It should also be noted that the capstone’s death attack is not tied to creature type, but is contingent on favored terrain and comes with a hard cap of 3/day. This is perhaps the easiest to use shifter-style class I know – it has merit in that regard. However, at the same time, I think that Interjection Games’ Animist and Everyman Gaming’s Shapechanger (from Paranormal Adventures) are the more interesting classes, though both require a higher degree of system mastery. If you’re looking for a no-frills shapechanger, though, then this fellow still holds up. The spell-less ranger was a resounding success when it was first released, and it remains so to this date – the class is fun, straightforward and easy to grasp, and the archetypes and their exchanges are meaningful engine-tweaks. The class is fun and well-made and remains a true classic. While we’re on the subject of nature-themed classes, let us talk about the shaman, now renamed spirit shaman following the release of Paizo’s ACG-class. The shaman is basically the oracle-like spontaneous caster variant to the prepared druid. The spirit shaman offers d8 HD, 4+Int skills per level, 3/4 BAB-progression, good Fort- and Will-saves, proficiency in light and medium armor and shields, but only non-metal ones and full spontaneous spellcasting from the druid’s spell-list, governed by Charisma. The usual alignment-opposite restrictions apply and the class begins play with wild empathy as well as +2 to Knowledge (nature) and Heal. 2nd level nets woodland stride and 4th level provides wild shape, with elemental and plant shapes added at higher levels. Important and more fun that one gets first: 3rd level nets shaman’s touch, which may be used Cha-mod times per day and duplicates scaling healing spells/dealing damage to the undead. 9th level provides spirit dance, which is basically a 3-round means to ritualistically modify spellcasting to improve the spellcasting for higher DCs and later, free metamagic addition (with a cap to prevent abuse) and better penetration of SR. 13th level nets class level rounds in spirit form, as per ethereal jaunt, with 17th level astral projection may be undertaken, with the added benefit of potentially providing legend lore benefits, representing a vision quest of sorts. The spirit shaman also gets totem spells depending on totem chosen. The spirit shaman also chooses a totem secret at 1st level, 3rd level and every 4 levels thereafter, allowing the class to e.g. spend time doing haruspex to see into the future,, become invisible, conjure forth protective spirits, etc. Nice: These scale and improve and include a super-potent trance that nets a massive +20 bonus to an Intelligence-based skill check. Seeing the incorporeal, better damage versus the incorporeal, etc. – these are nice. Now I am not a big fan of ability score substitution, so using Charisma instead or Dexterity for AC, Reflex-saves, etc. isn’t something I’m too keen on. Then again, that is my own bias and not something I’d penalize the pdf for. The capstone, however, is slightly problematic, as it renders the character functionally immortal in a way: After 7 days, the character returns from life as per true resurrection. The spirit shaman also gets infinite spirit dance uses. Now, the class also gets a spirit guide, which is basically a modified form of animal companion that can deliver touch spells, act to deliver touch spells and become incorporeal at higher levels. The pdf contains 17 different sample companion stats, all with totem spells noted. Archetype-wise, we get 3 archetypes, the first of which would be the elemental shaman, who gets an elemental companion, which is clearly intended to replace the regular spirit guide, but doesn’t say so in a little oversight. Instead of woodland step, we get Elemental Spell as a bonus feat as well as a +2 increase to the DC of spells with element-related descriptors. Wild shape is relegated to 6th level and focus on elemental body improvement. The archetype sports companion stats, complete with totem spells, for the 4 classic elements. The second archetype is the primal shifter, who gets diminished spellcasting, but heals a bit of damage whenever the primal shifter changes form via his wild shape. The dance-mechanic is similarly changed, instead focusing on enhancement of physical and combat capacities. The third archetype is the witch doctor, who gets healing-themed bonus spells. These fellows replace wild empathy with spirit sense and replace woodland stride with Brew Potion. The archetype can use shaman’s touch class level + Cha-mod times per day, but at the cost of diminished wild shape capacity. The spirit shaman is another class that holds up really well to this date – the spontaneous, very druid-y spirit guide/spirit shaman-trope is well-executed here and has seen quite a lot of use in my games. The class is easy to grasp, tight and neat. As a nitpick, I noticed one instance where the original “shaman”, sans the “spirit” remained, but this is an utter non-entity of an oversight here, as the context is readily evident. While we’re on the subject of spirits and related mysticism, let’s talk a bit about a relatively recent addition to the product-line, let’s talk about the White Necromancer. White Necromancers get d6 HD, must be non-evil, get 2 + Int skills per level, as well as proficiency with simple weapons (no armors and shields – arcane spell failure), 1/2 BAB-progression and good Will-saves as well as full spellcasting of up to 9th level. Spellcasting is handled via Charisma and thus is spontaneous. The class gets Eschew Materials at first level and surprisingly, is not banned from casting evil necromancy spells, but the respective spells use two slots when being cast – interesting balancing there! This restriction is btw. removed at 4th level. They also add their Wisdom-modifier to all Knowledge (religion)-checks pertaining death and the undead, burial rites etc. and receive +1/2 class level (minimum +1) to Heal skill checks. As low-level signature ability at 1st level, they also get the option to Rebuke Death as a standard action, which translates to healing living creatures by touching them for 1d4+1 per two class levels, usable 3+Cha-mod times per day. Nice…at least at low levels. At higher levels, a more rapid scaling of healing would very much be in order to make the class retain viability as a healer. At 3rd level, the class may also Turn Undead 1 + Charisma-modifier times per day and the class is treated as having channel energy, but ONLY for the purpose of turning the undead. Adding on further channeling feats is also mentioned and covered regarding ability-interactions. The 4th level provides the ability that lends the class its name – white necromancy. Undead creation-spells cast by the White Necromancer no longer count as evil and the resulting undead are free-willed, if intelligent, and of the same alignment as the White Necromancer – and as a crucial difference to regular undead: They are not slaves. To make them perform a task (even mindless ones), requires a Diplomacy-check on behalf of the White Necromancer – and while I can hear some groans, I do think that’s valid – interrupting someone’s eternal rest should be no laughing matter and require some finesse. Intelligent undead have a friendly disposition towards the white necromancer, and as such checks to request tasks receive a +2 bonus. At 5th level, the class gets perhaps one of its most iconic abilities with Life Bond, a supernatural ability. As a standard action, the White Necromancer may create a bond between her and one living creature within 90 ft. Each round at the White Necromancer’s turn, each bonded creature (of which the White Necromancer may have up to her class level active at once) is healed by 5 hp if they’ve been damaged for more than 5 hp below their maximum hp, while the white necromancer siphons her life into them. Now this ability seems weaker on paper than in play – the tactical options it offers are significant and beyond that, the ability mirrors well the duality between life and death as well as lending itself to great potential for heroic sacrifice: We’ve all been there, the villain is almost vanquished, but it becomes readily apparent that she/he/it will take on PC down with it – with a solemn smile, the white necromancer can now make the conscious decision to give his/her life to give the PCs just that edge to survive. Any number of bonds may be ended as an immediate action, btw. This component of the engine is further enhanced at 7th level, with necrotic transfer, when the white necromancer may sacrifice up to 10+Constitution-score (NOT modifier!! )+class level hit points and transfer them via touch to an ally. 7th level nets speak with the dead for class level rounds, with 9th level and every 2 levels thereafter yielding a cumulative -2 penalty to resist the ability. 9th level also provides lifesight 10 ft., which increases by 10 ft. at 13th level and every 4 levels thereafter. At 11th level, damage-dealing skeletal arms erupting from the ground make for a more macabre form of attack in a 20 ft.-burst, with scaling, properly codified damage and a Ref-save to halve. An additional daily use is gained every 4 levels after 11th. 13th level provides the option to turn incorporeal for a limited number of rounds each day, and at 15th level, the class adds +1/2 class level as a morale bonus to all saves vs. death effects and gets a save, even when such an effect would usually not provide for one. It would be nice to know the DC for non-spell-based death effects, though. Starting at 17th level, the white necromancer can temporarily emit an aura that nets immunity to death effects, energy drain, negative levels, etc. The capstone, unsurprisingly, offers immunity to death effects. The character can also be no longer reduced below 1 by ability score damage/drain and may 1/day cast power word kill, affecting up to 150 hp worth of targets. The white necromancer may also nice per round cast bleed/stabilize as a free action. It should be noted that, RAW, the white necromancer has a unique spell-list, though expanding it should prove o be relatively simple. As before, we get three archetypes: The grave warden replaces the low level healing touch with 3 + Charisma modifier sanctify corpse, with 10th level allowing the archetype to make it permanent 1/day. Instead of the Turn Undead-angle, the grave warden gets channel energy, but only to damage undead. At 20th level, this ignores channel resistance, if any. Life bond is replaces with detect evil, detect undead, hide from undead, which may be cast a total of 3 + Charisma modifier times per day as a SP. The other transference ability nets a scaling skill boost versus the undead. At 17th level, we get a potent defense-buff aura that can also be empowered by channel energy uses to destroy undead that dare enter it, thankfully with a caveat that makes undead with twice as many HD as the grave warden immune. In essence, this one loses the healer angle and instead focuses on undead destruction. The second one would be the grave bound, who loses the high level protective aura in favor of cold resistance 10, DR 5/- and +4 t saves vs. spells and SPs cast by undead. Unintelligent undead also no longer notice the grave bound unless attacked by him. Life bond, a pretty important ability, is exchanged for an undead companion. These companions share the same basic advancement table and increase in power at 8th, 12th, 16th and 20th level, gaining new abilities depending on their type. There is a complaint here regarding their base stats, though: The zombie, for example, has AC 16, with only +2 natural noted in the brackets. The ghost’s starting AC is 17, but ability-score-wise, should be 15. Some of the ACs note the constituent bonuses, some don’t. This is an inconsistency that could have been caught here. 6 different companions are provided. Finally, the necrotic healer get better healing touch and a couple of bonus spells and may take negative conditions of others, taken from a fixed list, to suffer for them – RAW, the condition must be suffered for 1d3 rounds or its original duration, whichever is lower. I have an issue with this, as it can be applied to permanent conditions. Instead of communion with the dead, we get enhanced healing (as if Empower Spell’d). 9th level allows for the absorption of wounds/effects that allies suffer from as an immediate action (limited daily uses) and the high-level protective aura is enhanced by lasting + Charisma modifier rounds. I really like the white necromancer. I still do. At the same time, I like it less than I should. I don’t know, I find myself wishing it had a couple more unique tricks up its sleeve, a bloodline-like component or something like that with different paths for final death, retribution, etc. With the focus on life/self-sacrifice/etc., a kind of buffer/shield-engine would have made sense as well – if you roll HD and roll badly, you’ll be in pain – I definitely suggest contemplating Constitution as highest or second highest ability score. Still, it’s a good class and I stand by my original verdict of 4.5 stars for it, even though grave-bound clearly is the strongest archetype, losing not enough for the power the companion grants. Flavor-wise, the martyr-style scholar of death is nice and easy to grasp and play. While we’re on the subject of full casters and the like, let’s move on to the priest-class. The priest class receives d6 HD, 4 + Int skills per level and gets 1/2 BAB-progression, good Will-saves and proficiency in only simple weapons. The class begins play with an aura as per the cleric’s default and bonus languages include the respective languages of the alignment-related outer planes. Similarly, the restrictions we know regarding opposed alignment spells still apply. A priest draws her spells from the cleric spell list and must prepare them in advance; however, they are not expended upon being cast, instead consuming a spell slot available. The governing spellcasting attribute for the priest would be Wisdom and the priest begins with 1 + 1 spells of first level prepared, +4 orisons. Obviously, as a full caster, she progresses to learn up to 9th level spells and the maximum spells per day per spell level clock in at unmodified 4, with prepared spells capping at 4 + 2 per spell level. The plusses in the spells known list refer obviously to the domain spells; a priest selects a total of 3 domains from her deity and she gains all of the domain powers and bonus spells of the chosen domains. The priest’s spellcasting is also tied to her holy symbol, with which she shares a sacred bond – much like an arcane bond, casting without it becomes problematic, but here’s the kicker: The priest may use the holy (or unholy) symbol to cast single-target (excluding mass/communal versions) cure or inflict spells as though they had a range of close instead of touch – which is a huge boon. Back in 3.X literally EVERY cleric in my games had the feat to do just that. The priest also receives access to channel energy at 2nd level, improving every 3 levels after 2nd by +1d6, though the ability is governed by Wisdom for the class, making it less multiple-attribute-dependent (MAD). 7th level optionally decreases activation action to a move action, at 14th level it may even be executed as a swift action. Since the ability has no per-round cap, that makes channel pretty nova-like and can allow the priest to channel thrice in a round. Yeah, that is problematic and was one of the aspects of the class that should have been addressed for the compilation. 6th level and every 6 levels thereafter net a bonus feat from a nice selection of mostly channel-themed feats, and, as a capstone, the class becomes immune to death attacks and negative levels and may never be reduced below 1 in any ability score. Additionally, the priest remains alive until twice negative Constitution score in hit points is exceeded. The customization options of the class include so-called divine gifts, which can be used 1/day as a swift action. 10 such gifts are provided and all are available – you don’t have to choose. The priest may use the ability, as mentioned, 1/day, but may use it +1/day for every 3 levels beyond first. If a gift enhances a spell, it may only enhance cleric spells and only one gift may enhance each spell. The gifts include CL and DC-increases of the next spell cast, invisibility (that scales up to greater invisibility at 7th level), metamagic enhancements, immediate action rerolls, wings at 5th level, Ac and save bonuses with DR and SR or bursts of raw, damaging divine power…or, well, spell-swapping. The book provides two archetypes for the priest, the first of which would be the chosen of nature, who gets a modified class skill list and draws spells from the druid spell list. Instead of channel energy, we get nature shape, a variant of wild shape at 2nd level. The ability counts as wild shape for ability interactions and comes with Natural Spell baked into it, but only duplicates increasingly more potent beast shape spells, capping at VI, and unlocks plant shapes at half the value of the beast shapes –i.e. upon unlocking beast shape IV, plant shape II is unlocked. Daily uses increase on a total basis. 6th level’s bonus feat is replaced with constant speak with animals/plants, and the bonus feat of 12th level instead allows the archetype to optionally activate nature shape as a move action. The bonus feat at 18th level is replaced with 1/day foresight, only usable in a natural environment. The second archetype would be the guarded priest, who gets a slightly modified spell list to account for the fact that divine gift is replaced with an unchained summoner’s eidolon that must take the agathion, angel, archon, azata, daemon, demon or devil base evolution. The eidolon may also choose a new 3-point evolution, namely smite evil or good, depending on alignment, using its own Charisma and HD to calculate effects. The evolution may be taken more often to grant additional daily uses. The priest was and still is a class I always wanted – a full, divine caster that is not a front-line combatant. The issue here is that the cleric already is a full caster, which means that the priest needed something to excel beyond the capabilities of the cleric. The divine gift angle of a deed-like engine is a good idea, though I did wish the class had employed a slightly more rewarding engine here. With the advent of influence mechanics, it would have been nice to add such an angle. The nova-issue hasn’t been addressed, which may necessitate some sort of gentlemen’s agreement. Ultimately, I like the class, but I want to like the concept more than I actually enjoy the execution. While we’re on the subject of full casters and executions that I don’t like as much as I want to: The theurge is back. The class gets d6 HD, 2 +Intelligence modifier skills per level, 1/2 BAB-progression, proficiency with simple weapons, good Will-saves and prepared spellcasting -arcane spellcasting governed via Intelligence and divine spellcasting governed via Wisdom – both from first level on. A Theurge gets a spellbook and a prayerbook and the latter requires the divine spells to be learned similarly to how arcane spells behave – from scrolls or levels. The superior spell selection of the original iteration has been reigned in somewhat. The class gets Scribe Scroll as a 2nd level bonus feat and 3rd level allows the class to reroll any concentration check, taking the better result. While first, slots are distinct from another, starting at fourth level, arcane spells may be prepared via divine slots and vice versa, but at a penalty level-wise to the spell prepared, i.e. second level spells need to be prepared as third level spells etc. This may not be done if a spell exists on both spell lists, preventing cheesing, and the ability clarifies the maximum spell level that may be thus prepared via the other casting tradition’s slots. The capstone gets rid of this limitation regarding the spell slot higher (but not the maximum level!) and allows the theurge to add a metamagic feat for free to a spell cast, up to either Wisdom or Intelligence modifier times per day, whichever is higher. The capstone gets rid of this minor penalty, though. At 5th level, theurges may cast two spells with the same casting time at once – one arcane, one divine, with targets affected by both suffering from a -4 penalty to saves, with the theurge getting +4 to CL-checks to overcome SR with them. This may be used 1/day, +1/day per 6 levels after that. They also learn to cast a select limited array of spells as SPs, starting at 6th level, where one 1st level spell may be chosen. 9th level and every 3 levels thereafter yield another such SP, with the maximum spell level that may be chosen increasing by +1 as well each time. 8th and 14th level net a bonus feat chosen from a limited list and 9th level nets the wand adept ability, using his own ability scores (Intelligence and Wisdom) to calculate save DCs when using wands containing spells from his spell lists. At 14th level, the higher caster level of theurge or wand is used. To nitpick here, the save-DC-increase should only apply to spells known. The theurge gets no archetypes. I still don’t like the theurge, even though it has gotten rid of one of its worst offenders regarding spell-list poaching or non-full-casters. A full caster that can cast both divine and arcane spells is a cool concept, and yes, the amount of spells cast (which never increases above 2 arcane + 2 divine per level (+ bonus spells via Intelligence + Wisdom) is severely restricted. This means every spell needs to count. I get that the general restriction on spells-slots is there for balance. I’m not sold, though, that it’ll make for a particularly fun playing experience. Sure, once you hit out your crême de la crême spells, you’ll own the game…but what about the other time? Unlike most other classes, the theurge has nothing but spellcasting and will thus resort to wands and staves and scrolls. You’ll be carrying a buttload of spells-in-a-can around since you don’t have enough spells for proper utility tricks, proper buffing, proper debuffing – essentially the class is geared very much toward being flashy super-spell nova-heavy. Which you *may* like, but personally, I think the class would have been more rewarding with more casts per day and a more restricted balancing via spells known. So, while the class has gotten rid of its rules-wise problematic aspects, its basic design premise remains: It’s a glass pumpgun (also re buffs/debuffs) – two devastating shots and empty. Personally, I’d be not keen as a DM to structure my adventures to “empty” the super spell-arsenal of the theurge or to play one, trying to keep my super-ammo for the big bad boss. Now all of this sounds negative, but the class per se is not a bad design, it does have its niche in which it will excel, and I’m pretty sure that some folks out there will like how this one plays. While I’m not sold on the place in a regular adventuring group, I do think the theurge will work superbly in 1 on 1-adventures and small groups – especially if the DM modifies adventures accordingly, groups starved for players get essentially divine and arcane in one class without resorting to gestalting – so yeah, the theurge has its niche, though I maintain it could have been more versatile in its use. With the advent of Occult Adventures, an elegant way to balance the two spell lists would have, for example, been a kind of Burn-like engine that activates when switching from divine to arcane and back…or as a general resource to account for more spell slots. So yeah, over all, an improvement over the previous iteration of the class, but still not a class I enjoy or would allow in my game. Since we’re already neck-deep in casting classes, let’s take a look at one niche that the book devotes two whole classes to: The blaster. The blaster is a popular concept, as evidenced by the gazillion of different options in that regard. One of the earlier incarnations of blasting classes in PFRPG was the Battle Scion, only predated, I believe, by the Archon and Vanguard classes released by Rogue Genius Games (back then Super Genius Games). Much like the vanguard, who was also penned by Marc Radle, the Battle Scion replaces a form of arcane gish, an arcane paladin, if you will. The Battle Scion gets d10 HD, full BAB-progression, good Fort-and Will-saves, 2 + Intelligence modifier skills per level, proficiency in light, medium and heavy armor, shields and simple and martial weapons AND may cast spells while in armor from the very first level onwards without arcane spell-failure chance – thankfully still specifying regular spell failure chances for spells granted by other classes. Starting at 4th level, Battle Scions get access to arcane spells from the sorcerer/wizard-list of up to 4th level, which they cast as a prepared caster via Intelligence as governing attribute, with a caster level equal to their battle scion level-3. Furthermore, starting at 4th level, they also count as fighter of battle scion level -3 for the purpose of qualifying for fighter-only feats. At 2nd level, the battle scion gets a +1 deflection bonus to AC as well as a +1 insight bonus to hit with force blasts, both of which improve by +1 for every 4 levels beyond 2nd. 3rd level nets Combat Casting as a bonus feat. What are force blasts? They are basically 60 ft.-range touch attacks that inflict 2d4 damage, +1d4 for every 3 levels beyond 1st. SR applies and they are SPs, but battle scions treat their CL for the purpose of overcoming SR as their class level. The battle scion may emit one such blast 3 + Intelligence modifier times per day as a standard action, making sure that e.g. ranged weapons are not invalidated. That being said, the damage is untyped and a force effect, which is odd – I expected force damage here, but RAW, this would even bypass the very few force resistances out there. Considering the limitations imposed on the ability, I can see it work, though. Starting at 5th level, the class gets the dweomer weapon ability, which allows the battle scion, as a standard action, to focus energy into a weapon, which proceeds to shed light as a torch. The weapon gains a +1 enhancement bonus, which increases by +1 at every 3 levels beyond 5th, capping at +6 at 20th level, but only to the regular maximum of +5. You guessed it: The plusses can be exchanged in favor of special weapon properties and are added to pre-existing properties of the enhanced weapon. The ability lasts for 1 minute and may be used 1/day, +1/day for every 4 class levels beyond 5th. 6th level and every 4 levels thereafter nets a metamagic or combat bonus feat. 7th level increases the Combat Casting bonus to +6, with 11th level improving that to +8. Starting at 11th level, the battle scion may cast a prepared arcane spell (should specify from its own spell list, but oh well) as a swift action, but the spell must have a casting time of 1 standard action or less and the ability may only be used 3 + Intelligence modifier times per day. Starting at 8th level, armor check penalty is reduced by 1, and maximum Dexterity bonus allowed by armor is increased by 1. This bonus further improves at every 4 levels thereafter, and the ability also provides unimpeded movement in medium and heavy armor. The capstone turns the CL and fighter level to full class level and allows for the immediate action casting of a spell when confirming a critical hit. The class comes with 3 archetypes: First, there would be the bonded scion, who loses the deflection aura and makes his weapon an arcane bonded item and may enhance his bonded weapon. 8th level’s armored maneuvers instead nets a Improved Bonded Object at 5th level. Instead of 6th level’s bonus feat, we get +2 to critical hit confirmation with the bonded weapon, which increases by +1 for every four levels thereafter. Instead of 10th level’s feat, we get the option to use a force blast to temporarily enhance the weapon, making it ghost touch and adding class level to damage versus incorporeal foes. 11th level’s spell tactician benefit is replaced with the option to make the bonded weapon bane, but at a higher damage output. 14th level’s bonus feat is replaced with Awaken Bonded Object. Mostly a numbers game regarding a special weapon. The second archetype is the force blaster, who may use his force blasts as a move action at 2nd level. At 11th level, instead of spell tactician, he may use force blast 3/day as a swift action. 5th level increases the damage of these as if empowered, and the force blasts come with a ranged combat maneuver that may push targets and knock them prone, all at once. This replaces the dweomer weapon. At 6th level, the archetype is locked into a blast-enhancing feat and 10th level’s bonus feat is replaced with the option to fire two blasts per use of force blasts, which upgrades to 3 at 17th level. The third archetype would be the wild scion, who gets Eschew Materials instead of fighter training and has spontaneous spellcasting governed by Charisma. This is a really sucky proposition, considering that none of the other class features are adjusted – suddenly, you also need Charisma, for an archetype that is much too MAD. This one feels like a bad filler-afterthought that hasn’t been contemplated properly. I wasn’t the biggest fan of the battle scion when it was released, and that hasn’t changed…but even if you liked it, it hasn’t aged well. At all. In a world, where Interjection Games’ ethermagic makes for highly customizable, balanced blasters, and where the big dog Paizo has introduced the versatile, unique kineticist, the battle scion feels a bit off. The fact that the class uses more than full BAB (bonuses granted by class features) for the blasts feels like unnecessary overkill nowadays; touch attacks don’t need a full BAB-class. When taking a look at e.g. vigilante as a relatively recent, versatile and pretty amazing class, the battle scion feels a bit rudimentary. The godblade-weapon-enhancer is a concept that a lot of classes have done in more interesting ways as well. The class isn’t bad per se, mind you – but unlike e.g. spell-less ranger, it hasn’t aged well. There is a second blaster class herein, one that makes its first appearance in this book. The name should make clear what it’s all about from the get-go: I’m talking about the warlock. Yep, we get a classic blaster-class within this book, so what does the warlock do? The warlock class gets d8 HD, 2 + Intelligence modifier skills per level, proficiency with simple weapons and light armor and the warlock’s bond weapon, ¾ BAB-progression and good Fort- and Will-saves, as well as Intelligence-governed prepared spellcasting of up to 6th level, drawing upon the witch’s spell list. This spellcasting behaves analogue to the arcanist, though. The class has essentially two central angles: The warlock’s bond is a variant bonded weapon and gained at first level. It also acts as the familiar/spellbook substitute for the spell preparation of the class. The means of gaining new spells from e.g. other bond weapons and the like is concisely codified, and learning from scrolls is possible. The general weapon category of the bonded weapon determines a static bonus: The book distinguishes between 4 categories, with axes providing +2 to confirm crits, blades netting +2 to initiative, hammer and flails provide +2 to Fort saves and polearm bonded weapons allow the warlock to shorten his grip as an immediate action and attack adjacent targets at -2 to atk; if a polearm is not a reach weapon, the warlock gains a +1 insight bonus to attack rolls with it. Guess which one I liked best? Yeah, the polearm bonus is neat. While wielding the bond weapon, the warlock adds Charisma modifier to CMD to resist disarm and sunder and this bonus applies to spells et al. that target the weapon and seek to change it. At 4th level, the warlock may deliver touch spells with it, and at 7th, 12th and 16th level, one of classic magic weapon properties is chosen from a brief list. At 10th level, the weapon awakens, becoming intelligent. Senses and attributes are defined and so are the skills available to the bonded weapon. Also at this level, we gain telepathy with the weapon. 14th level unlocks dark defenses, an ability that provides immunity for the shaken and frightened conditions as well as a +2 morale bonus to Will-saves. As a standard action, you can grant yourself SR equal to 6 + class level for class level rounds. This SR may not be suppressed. At 18th level, the morale bonus granted by dark defenses scales to +4 and the panicked condition is added to the immunity-list. The SR upgrades to 10 + class level. At 20th level, finally, the bonded weapon gets one of the most potent special weapon abilities, once more chosen from a brief list. It should be noted that aforementioned immunities only apply while wielding the bond weapon. The second defining feature here should not surprise anyone – we get the dread bolt, which may be executed as a standard action. It’s a ranged, single-target blast that targets touch AC and has a range of 60 ft. It inflicts 1d6 force damage and increases that by +1d6 for every two warlock level beyond 1st. 5th level increases the range to 80 ft., and every 5 levels thereafter, the range further increases by +20 ft. Now, I’m not a fan of this being force damage, as the warlock gets infinite dread bolts per day, and force is the most valuable damage type in PFRPG, short of untyped, which is most of the time an oversight anyways. My issue lies within another construct here: Dread bolts “are treated as a weapon for purposes of making multiple attacks at higher levels.” This directly contradicts the activation action, which is a standard action. It also opens up a rather puzzling conundrum: If the activation action is correct and the dread bolt can indeed be executed as a standard action, does that allow for full attacks with dread bolts as a standard action? I assume no, but this aspect really needs polishing. Why do I assume that this is not the case? Beginning at 8th level, a warlock may attack with bond weapon and dread bolts in any combination or order when executing full attacks. This sentence implies that this was not the case before, but depending on how you read the standard action/iterative attack interaction, you get wildly different abilities here. This needs some cleaning up. 2nd level yields +1/2 class level to Knowledge (planes) and Knowledge (arcana). Beginning at 4th level, the warlock gets a +1 deflection bonus to AC and a +1 insight bonus to hit with dread bolts, which both increase every 4 levels thereafter. This ability is not required and feels like needless escalation of numbers, as ¾ BAB-progression mathematically suffices to hit pretty much any CR-relevant touch attack; it’s, in essence the gunslinger/battle scion BAB-overkill for blasting. At 10th level, warlocks btw. add Intelligence modifier to dread bolt damage. At 18th level, the warlock may 1/week contact other plane in a more reliable manner. At 14th level, the warlock may roll for normal damage when adding a dread bolt transmutation to a dread bolt. What’s that? Well it represents, apart from spellcasting, the customization of the warlock. Beginning at 6th level, you get the first such dread bolt transmutation. As a swift action when hitting a target with a dread bolt, the warlock may activate one such transmutation instead of rolling for damage. Only a single transmutation may be used per round (that is already handled by action economy, so a bit weird), and save DCs are governed by Intelligence, with class level doubling as CL for SP-purposes. Transmutations don’t stack with themselves. This ability may be used 3/day, + 1/day for every 3 levels beyond 6th. So, why is there this caveat regarding per round cap? The capstone lets you execute a transmutation whenever you hit with a dread bolt. I *assume* that this does not get rid of the daily cap of uses, but explicitly stating something to that extent would have helped here. So, what do these transmutations do? Well, basically, we have hard debuffing here, with bleed, phantasmal killer, negative conditions – you get the idea. There are 20 such transmutations and they are all available, provided that the warlock meets the minimum prerequisites regarding levels. Some of these employ condition scaling (fatigue upgrades to exhausted at 9th level, for example) and there are a couple that will not fit with all games: The agonizing transmutation, for example, causes the target to be staggered for a whopping class level rounds, with a successful save only reducing that to ½ class level. Yep, you heard me. This is a reliable stagger lock that can be taken as soon as 6th level. So yeah, I’m afraid that this fellow won’t get near my game. The class gets a single archetype, the dimensional traveler, who replaces the boost to AC and damage with blasts with 3 + Intelligence modifier swift action dimension doors that are restricted to the warlock. At 4th level, range is 20 ft. and this distance increases by +5 ft. every two class levels after that. Instead of dread bolt transmutations, 6th level yields Dimensional Agility and the bonus granted by the feat scales for the archetype. So, all in all, as a person, I don’t like this class. It is rather linear and the transmutations are very strong, and pay for that strength with being limited in use. Which means you get a few potent debuffs and then run out – by decreasing the transmutation potency and making them generally available, the class would imho gain appeal. Compared to kineticist and ethermancer etc., the class boils down to the same blasts, with a few spells added. The lack of restrictions on force blasts also bugs me. Compared to what you can do with kineticist (and e.g. N. Jolly’s phenomenal Dimensional Ripper archetype, see Kineticists of Porphyra III), the warlock, to me as a person, is boring and too nova-y regarding the transmutations. Apart from spells, there is also no customization apart from minor bonded weapon tweaks, making the class pretty linear, which annoys me – when all members of a class have pretty much the same capabilities, it tends to bore me fast. This is a personal preference, though, and will not influence the verdict, for what is a huge no-go for me may actually be a feature for a lot of folks out there. Don’t like the kineticist’s burn-engine? Don’t like a ton of moving parts in your class? Just want a foolproof, uncomplicated take on the blaster sans a ton of choices or build options? Well, then you’ll like this class. Just make sure that the GM is aware of the potent debuff-locks and makes a ruling regarding the objectively flawed base bolt engine. While we’re on the subject of ranged combat specialists, let’s talk about the mystic archer, who gets d8 HD, 2 + Intelligence modifier skills per level, proficiency with simple and martial weapons, light armor and buckler. Spells gained by the class don’t suffer from arcane spell failure when wearing light armor or using a buckler. The class gets full BAB-progression as well as good Fort- and Ref-saves. They begin play with access to prepared arcane spellcasting, governed by Intelligence, but it only scales up to 4th level spells. The class gets +1 to Perception checks and increases the range increment for any bow by +5 ft., with both increasing by a further +1/+5ft at 5th level and every 4 levels thereafter. The class also begin with Weapon Focus for a bow as a bonus feat. Starting at 2nd level, all arrows fired by the class are considered to be magic and silver, and starting at 10th level, they are treated as the alignment of the character for the purpose of bypassing DR. 3rd level and every 3 levels thereafter yields a bonus feat chosen from a specific list. Upon reaching 4th level, the mystic archer may use a standard action to enhance the respective bow with special weapon properties, in a variant of similar enhancements of e.g. the battle scion. Starting at 5th level, we choose the first archer trick, with another unlocked every 4 levels thereafter. These include dispelling arrows, close combat shots, arrow-based disarming etc. The class only gets 7 to choose from, though – a few more would have been nice. At 7th level, the class gets the imbue arrow class feature, allowing the class to place touch evocation spells upon arrows, with 12th level adding area of effect (emanation and spread only) spells. It should be noted that these still retain some restrictions that prevent cheesing of long casting time spells. This is one of the best ways to handle the concept that I’ve seen so far, but it lacks a crucial piece of information – how do the imbued spells behave regarding critical hits? No idea. 8th level lets you 1/day execute a hail of arrow, targeting 1 character per 3 mystic archer levels in a 60 ft. radius, executing an attack at full BAB against them. Additional daily uses are gained every 4 levels thereafter. 10th level increases critical range, but does not stack with Improved Critical or similar threat range increases, thankfully. Additionally, once per day as an immediate action upon confirming a critical hit with the bow, the mystic archer may increase threat multiplier by 1. At 11th level, we get deliberate aim, which translates to a single full-round action attack, adding ½ class level to atk. At 16th level, this may ignore armor and shield bonuses. At 14th level, we get 1/day phase arrow, which bypasses nonmagical barriers, cover, concealment, armor and shield bonuses as a standard action. An additional daily use is gained every 3 levels thereafter. 16th level nets the option to, as an immediate action, sacrifice a prepared spell to grant herself an insight bonus to atk until the end of her turn. At 19th level, we get penetrating shot, the archer may make a -4 atk versus a creature behind a target successfully crited. Okay, do the special shots à la imbued, any spells laced into the shot etc. apply to the second target as well? No idea. The capstone auto-confirms critical hits and, once per day, as a full-round action, she can fire an arrow that may cause exactly 100 hp damage if it hits and the target fails the DC 23 + Intelligence modifier Fort-save. The class gets no archetypes. The mystic archer does a lot right, executing the notoriously difficult arcane archer concept rather well. At the same time, the rules-integrity could be a bit better. The rather notorious savant class introduced in the first New Paths Compendium has received a general overhaul. The new version of the class gets d8 HD, 4 + Intelligence modifier skill points per level, proficiency with simple weapons and light armor, but not shields, as well as ¾ BAB-progression and good Will-saves. The savant chooses an area of interest at 1st level, and does so again at 6th level and every 5 levels thereafter – this means that all savants will pick up all areas of interest by 16th level. Each area is associated with a number of knacks – knacks from the area of interest may be retained longer. What’s a knack in the context of the class? Well, it’s basically a borrowed ability, but requires first that the character scrutinizes a target. As a standard action, the savant can attempt a Perception check to identify a target, with the DC being 5 + the creature’s CR. On a success, the savant gets to know about aspects of the target’s statistics, with an additional aspect known for every 5 by which he exceeds the DC. The savant, upon scrutinizing the target, may gain a number of knacks equal to his maximum number of active knacks, which increases from 3 at 1st level up to 8. Gaining or changing a knack is a free action when scrutinizing, a standard action when consulting the notebook. Wait, what? Yep, at 2nd level, the savant gets a notebooks, which means that after losing a knack, the savant has 1 hour to pen it down in the book, with the number of knacks that can be maintained in it capping at Intelligence modifier. Some knacks may be gained multiple times at once, allowing for the use of knacks as mini-feat-trees and the like. Fyi regarding feats: The savant has to meet the prerequisites and uses his own level to calculate level-based variables. Some of the knacks, like scrutinizing BAB, refer to a knack bonus, which begins at +1 and increases by +1 every 3 levels thereafter. While the class specifies a maximum spell level for the class, which caps at 5th, there is a potentially HUGE problem with the engine here: The savant can duplicate scrutinized divine and arcane spells. This means that, for as long as your allies have the spell, you can cast it an infinite number of times. Yes, this pretty much is infinite healing/spell-blasting at 1st level. This is a gamebreaker of an issue that immediately should disqualify the class as written RAW for many tables, and one that could have easily been prevented by implementing a simple 1 scrutiny per day per target cap. At 3rd level, advanced knacks are unlocked, providing access to whole spell lists of targets, yielding attribute enhancers, etc. – these only last for Intelligence modifier rounds, minimum 1, though. Some of these advanced knacks do not count towards the limit of active knacks. At 8th level, the savant adds his knack bonus to aid another with a skill from a knack associated with an area of interest. 14th level nets the option to gain a basic knack sans scrutinizing or notebook 1/day. The capstone nets doubled knack bonus when gaining a knack associated with an area of interest…which is needlessly wordy, considering that the savant will have all 4 areas of interest covered at this level. Additionally, knacks associated with the area of interest no longer count towards the maximum. RAW, this translates to infinite knacks. Something, somewhere, in the development of this class went horribly wrong. The area of interest is supposed to increase the duration of knacks, but fails to specify how. The capstone similarly implies that there should have been more areas of interest at one point – unless infinite active knacks are what the goal was. The book contains the raconteur archetype for the savant, who creates an avatar corresponding to the area of interest,, with Perform (oratory) acting as the skill whose result determines knacks gained via epic storytelling. Yep, this archetype represents something akin to the old savant, but suffers, like the base class, from having a key ability based on a skill, which are notoriously easy to cheese with spells and items. Making that a level-based check would have been more balanced and elegant. The savant was the class I was most stoked for – its revision is really cool, in that it manages to get really, really close to making a really nice Blue mage type of class that bases its powers on foes encountered. System-immanently, this means that class does require a bit of metagaming, but per se, I would not object to that here. However, the rules-chassis has some unfortunate holes in it that seriously need fixing to work properly. The trickster class presented herein receives d8 HD, 4 + Intelligence modifier skills per level, proficiency with simple weapons plus rapier, longsword, sap, short sword, shortbow, whip light armor and shields (excluding tower shields) and may freely cast spells while only wearing light armor and/or using a shield. The class receives 3/4 BAB-progression as well as good Ref- and Will-saves and gains spellcasting. Spellcasting of the trickster is slightly more tricky (I’ll punch myself later for that one) than you’d expect: The trickster’s spellcasting is governed by Intelligence and thus is prepared according to convention. However, spells prepared are not expended upon being cast – instead, the spell slot of the appropriate level is expended. Metamagic is handled as for sorcerers and similar spontaneous casting classes. High Intelligence influences the number of spells a trickster can cast, but not the amount of spell-slots he has – this is pretty important for balance, so bear that in mind. In short, the trickster has somewhat arcanist-y casting. Tricksters begin play with 4 cantrips known and 2 1st level spells and increase that up to 6 for each spell level, barring 5th and 6th, which cap at 5. 5 is also the maximum spells per day limit. Akin to the alchemist and similar classes, spellcasting caps at spell level 6. The trickster also receives access to sneak attack and begins play with +1d6, increasing this by +1d6 at 4th level and every 3 levels thereafter. Similarly, at first level, the trickster gains trapfinding. Starting at 3rd level the trickster adds +1 competence bonus to Bluff, Disguise, Escape Artist, Sleight of Hand or Stealth, increasing the bonus by +1 every third level, though the new bonuses gained may be freely distributed among aforementioned skills. 3rd level also nets evasion and 6th, 12th and 18th level provides bonus feats from a limited list. 8th level provides uncanny dodge, 11th level improved uncanny dodge. At the 5th level, as a standard action, the trickster can cast a spell with a range of touch and deliver it as part of a melee attack, with the restriction of only working in conjunction with spells that have a casting time of 1 standard action or less. If the trickster hits, he also deals sneak attack damage in conjunction with the touch spell. Problematic here: The sneakspell’s damage is doubled on a critical hit, which can result in ridiculous numbers. At least metamagic can’t be applied. Starting at 17th level, a sneakspell that misses is no longer lost. 9th level provides ranged legerdemain, though the ability is thankfully MORE precise than that of the arcane trickster PrC, specifying how far you can propel stolen objects and increasing the required skill ranks to 5. At 14th level, the trickster receives Filch Spell, which allows the trickster to hijack ongoing spells requiring direction (flaming spheres etc.) as a move action 3 + Intelligence modifier times per day. 15th level provides Surprise spells – but unlike the imprecise original take on the ability, this one clarifies from the get-go how it works with magic missiles or AoE-spells. As the capstone, the trickster treats all 1s and 2s of sneak attack as 3s and auto-confirms crits executed with sneak attacks. Additionally, now metamagic feats may be added to sneakspells sans increasing the casting time. The class has some customizations, in the guise of so-called fortes, which is gained at 2nd level and yields new abilities at 5th and 9th level. The first would be Acrobat, which not only provides skill-bonuses to movement-related skills and eliminates the need for running starts to get the associated bonus. Additional movement while not carrying heavy load or the like and no armor check penalty for Dex-based skills can also be found here. At 5th level, the trickster gains a scaling bonus to AC and CMD and may also act as though under freedom of movement for trickster level round per day, but only for movement purposes. Provided the trickster has at least 10 ft. at 9th level, he can dimension door as part of the move action expended, but, in a unique twist, the total distance he can thus travel is limited and capped with a daily max. The second forte is arcane accomplice, which nets a familiar, though the familiar receives Disable Device and Sleight of Hand as class skills and can deal sneak attack as long as it’s within 30 ft. of the trickster – and yes, this means you can basically double-team on your own, greatly increasing the validity of sneak attack, though, for balance’s sake, a familiar’s sneak attack uses d4s, which proved mathematically feasible in my tests. 5th level goes one step further and nets the familiar all teamwork feats of the trickster as well as AC +2, while 9th level provides basically spring attack for the familiar, but only with regards to delivering harmless touch attacks – and yes, this is more versatile than you’d think. The third forte is Beguile and provides +1 to DCs and +1 to rolls to overcome SR, scaling by +1 at 5th and 9th level – but only when targeting creatures that would be denied their Dexterity-modifier or that are helpless. At 5th level, when successfully feinting, the target would be denied his Dex-mod to AC for the next melee attack or spell targeting by the trickster, but only when performed on or before his next turn. 9th level decreases the required action to feint to a move action, a swift action if the trickster has Improved Feint. The fourth forte is Spell Pilfer, which is easily the most unique of the fortes: As an immediate action, the trickster can make a Spellcraft check (DC 15 + spell level) to identify the spell and, if successful, the trickster may attempt to pilfer the spell. The caster receives a Will-save versus 10 + 1/2 trickster class level + Intelligence-modifier to negate the attempt. If the caster fails, he loses access to the spell known or prepared spell, while the trickster temporarily (1/2 class levels, minimum 1) adds the spell to his list of spells known. While the spell is pilfered, the original caster may not cast it, but the trickster may, provided he has an available spell slot. Only one spell (again, VERY important for balance) can be pilfered at a given time – pilfering a second spell, the previous spell immediately reverts to the owner. This ability can be used 3 + Intelligence modifier times per day. It should be noted that tricksters can only pilfer spells they can cast, another VERY important limitation. Now you may have noted that Will-saves are pretty easy for most casters – thus, at 5th level, the trickster’s Wisdom modifier is also added to the DC to resist the pilfer attempt. I am usually fiercely opposed to dual attribute-modifiers to anything, but considering that Wisdom is NOT a trickster’s crucial stat in any way, in practice, this is less problematic. 9th level allows the trickster to pilfer spells above his casting capacity, but thankfully with the caveat that the trickster can’t cast such spells – so no abuse possible. This is a very impressive ability in my book, since it makes spell theft work sans holes in the wording, sans abuse. Love it! I wish this level of care had been extended to some of the other classes that dabble in pilfer/duplication. The fifth forte would be shadow, which increases CL of shadow school or darkness-descriptor-spells by +1 and it also nets low-light vision and darkvision 30 ft. (Or +30 ft., if the trickster already has darkvision.) 5th level nets something unique – the option to 3 + Intelligence modifier-mod times per day animate shadows of targets to attack them (cool). At 9th level, the trickster can basically hide in plain sight while within 10 feet of a shadow other than his own and at that level, the shadow may use the trickster’s sneak attack. There are two trickster archetypes here, the dual forte and the forte master trickster: Both have diminished spellcasting, but the dual forte trickster replaces the 6th, 12th and 18th level bonus feats with a second forte gained at 6th level, for which he is treated as -4 class levels, a limitation that ends at the capstone abilities. The forte master adds two very potent abilities to each forte, gained at 11th and 14th level, replacing the 12th and 18th level bonus feats. Acrobats can inflict sneak attack when moving more than 10 feet and maintain actions after using dimension door. Arcane accomplices increase familiar potency and may teleport them to an adjacent square 1/day as a swift action. Beguilers get enchantment tricks, shadow masters darkness-related tricks, and spell pilferers may now steal divine spells as well. Big plus: For campaigns that prefer a bit lower power-level than what the rather potent trickster-chassis offers, the pdf has some advice regarding the limitation of spell-lists. I STRONGLY recommend implementing this advice for most campaigns. The trickster is a relatively young and pretty potent class and I still like it. 5th level provides trapfinding and 8th level Master Craftsman, or Gunsmith – the latter obviously only in firearm-using campaigns, though in such a case, the proficiency list should imho be extended from the get-go. Starting at 6th level, the tinkerer may modify up to 3 + Intelligence modifier grenades to have e.g. an increased splash radius, add incendiary cloud, remove squares from the detonation, etc. The capstone gets rid of the daily limit of these improved grenades and similarly gets rid of the daily limit of rolling twice in specialized skills. At 10th level, the tinkerer may suppress mechanical traps and becomes better at disarming them safely – the suppression can provide interesting scenarios. 12th level adds ½ class level to the Perception and Disable Device skill to disarm traps he made, as well to all saves against them. You may have noted that the class seems to be missing spellcasting. Indeed, while the tinkerer gets mending/make whole SPs, that’s about it – and there is a very good reason for that. You see, this is actually a pet-class that gets a clockwork companion from the get-go. Picture these guys as basically eidolons with the full array of construct immunities, which is brutal. They can be biped or quadrupeds and the book covers a ton of modifications, their evolution analogue, ranging from 1 to 4-points. And yes, e.g. flight has been properly locked behind 5th level. We unfortunately get no archetypes for the class, which is a bit of a pity – I like the non-caster pet-class angle, I like the grenades and this class is easily my favorite among the new ones. All classes get favored class options for a couple of races, with several of the cool Midgard races noted. Each of the classes also comes with a brief sidebar talking about the role of the class in the context of Kobold Press’ fantastic setting. The archetype chapter also includes some options for other classes: The Black Hat gunslinger, who gets jinxes, the black powder reaver barbarian, the gunfighter, the noble shootist gunslinger, beast-soul, iron staff and clockwork monks as well as paper drake monks, elemental ninjas and the futurist witch. Okay, here, I must address a massive elephant in the room. Notice how I haven’t mentioned psychic magic once? There’s a reason for that – the book does not support the concepts from Occult Adventures (or Pathfinder Unchained), which is a pretty huge flaw as far as I’m concerned and something I wanted to see updated. For example the coilgunner would have made for a great update, now that the Technology Guide has been released…but no, the archetype’s not in the book. Among these archetypes, it becomes pretty painfully apparent that such an update would have been smart. Noble shootist begs for swashbucklering; futurist witch for Technology Guide-synergy…and the concept of an elemental ninja has been done so much better by Legendary Games’ damn cool kinetic shinobi hybrid class. It is interesting to note that this chapter does not contain all the old material, and, alas, like the base classes, could have used a freshening up. The book was released in December of last year (2017), so plenty of time after OA and PFU’s release…and in the case of e.g. guarded priest, it is evident that the book *IS* known and that the compendium *DOES* reference it. So yeah, lost chance there. The book then provides a massive feat-chapter – but I’m not going to go into the details here – this review is already too big. There are Leadership variants to attract beasts or split Leadership in cohort and followers, ricochet shots and the like. Plus, I have already covered the majority of them at one point. Puzzling: No extra grenades feat for the tinkerer, and indeed, the new classes could have used a couple of new and exciting feats here. The books also reprints scaling combat feats, which are per se a good idea, but ultimately, the brief section can’t really implement the concept to yield a universal system. I like this, but this would have been the first thing I’d have cut from the compilation…or expanded to its own sub-chapter/own book. The compilation does include the beloved Death Feats and Flaws, which allow the return from the dead to mean something, granting unique abilities. These still rock hard. The gear chapter collates the items and magic weapons, including the regalia of Gax as legendary items. We also get a relatively big spell-chapter, which generally sport some evocative visuals, though e.g. arrow of the animal spirit should probably cause typed damage. The combat divinations are probably the coolest aspect, spell-wise – these are mostly low-level swift/immediate action spells intended for characters that have to dive into the fray and still want to cast (sans eating AoOs galore). Pretty much my favorite section in the whole book. We end with tracking sheets for animal companions, arrows, clockwork companions, favored enemies and terrains, prepared spells, spirit guides, summoned monsters and wild shapes. Editing and formatting in the current pdf version are very good on a formal level. On a rules-language level, the book is generally precise and gets intricacies right rather often, but also sports a few rather nasty blunders that hamper rules-integrity of core class abilities. This problem is exacerbated in the print version, alas – as drop-dead gorgeous as it is, I would usually recommend it sans hesitation. But there are more cut copy paste glitches in the print version, hiccups that were in the first compilation reprinted, etc. E.g. the flavor-text of the warlock archetypes references the white necromancer in the print copy. The theurge’s Fort-save has a glitch at level 8…you get the idea. The book should have gotten more careful editing pass before heading off to print. As presented, I’d tentatively recommend print if that sort of thing is less important for you. Otherwise, I’d suggest getting the pdf instead, which has since been cleared of a couple of these hiccups. The artwork inside is beautiful and full-color, with only a few pieces reused from Kobold Press’ classics. The pdf comes fully bookmarked with nested bookmarks for your convenience. This is the longest review I’ve written in a long while. Marc Radle as the lead designer, with additional content by Ryan Costello Jr., Crystal Frasier, Michael Kortes, John Ling Jr., Ben McFarland, Brian Suskind and Jerall Toi, has delivered an absolutely beautiful book. And there is a lot to like about this book. This does not change, however, that I, personally, was somewhat disappointed by it. Granted, it was billed and intended as a big compilation of the series and it does just that. However, it does not compile everything. And there was a compilation before it. I really, really hoped that this book would adapt to the changed realities of the game since the first compilation, including e.g. psychic magic for the consideration of spell-pilfering/knacks, Technology Guide and the like – alas, no such luck. 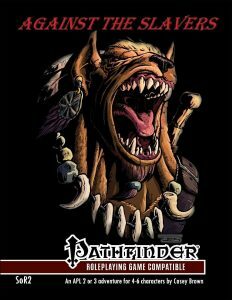 Pathfinder Unchained gets lip-service in a single archetype, while the monk and barbarian-archetypes, to name a few, could have used modified unchained variants that make use of ki powers, skill unlocks, etc. I usually don’t point the like out, but when the KS ran, OA or PFU were not new books. Both changed significantly what folks expect from Pathfinder classes and provided much-beloved engines and character options. The second compilation, alas, disregards these books completely, which is puzzling, considering the thematic overlap of a TON of options herein. As a person, this particularly saddened me, since I love the emphasis on choice, moving parts, skill unlocks etc. that these books championed. I also was missing the iconic appendix – the sample characters from the 20K stretchgoal for the new classes are not included. That being said, there is good to be said about he designs herein – the classes presented within universally manage to be pretty easy to grasp. You won’t need to spend a ton of time, figuring out how to build a character with them. You read them once and they’re ready to play. There is value in such easy to grasp designs and the design-tenet of simplicity. While this means that there’s not much in the way of internal differentiation between members of the same class, you may well like that. Unlike e.g. ethermancers or kineticists, you can pretty much run a warlock or battle scion after a cursory read-through. So while this book did not offer that much for *me*, it may well provide exactly what you’re looking for. If you wanted a very easy to grasp blaster, then this offers what you’re looking for. The book contains several, by now classic classes I absolutely adore –spirit shaman, spell-less ranger, white necromancer…there are many cool options here, but I can’t help but feel like this could have been one for the ages if it redesigned and expanded them. This compilation would have been a great chance to address the priest’s nova-channel, add more divine gifts, fortes, etc., add more spell-less ranger talents to account for the release of the slayer and vigilante, etc. Some of the new class options, while not bad per se, have serious flaws in components of their engines that make them feel like less than what they could have been. The savant, while better than before, nets infinite casting and has some wonky bits in its core engine. Additionally, the new classes get significantly less material – no truly new archetypes; heck, not even the Extra X-class feature feat for grenades. The warlock and tinkerer in particular could have used a couple of new tricks to set them apart from the gazillion other warlock-y or pet classes. How to rate this, then? See, here things become tricky. Herein lies the reason why this review is such a huge frickin’ beast. I can see this book work like a 5-star masterpiece for groups that don’t like a lot of nuts and bolts in their classes, that want easy and quick integration. If making a GM-call here and there doesn’t faze you, then the few engine hiccups become less relevant. That being said, if you expected updates for the classes, occult support or complex design-paradigms à la Direlock, Interjection Games, Dreamscarred Press, Everyman Gaming, Lost Spheres Publishing’ shadow weaver, Legendary Games’ kinetic shinobi, etc., then you won’t find these herein. If, on the other hand, well-made and elegant simplicity is what you’re going for, then you’ll probably adore the vast majority of the material within. This is why I provided this ridiculous level of detail in my analysis above – so you can judge for yourself whether the classes herein are something you and your group would enjoy. While, as a person, this fell short of what I expected from the second compilation of the series, as a reviewer, I have to take into account that the no-frills, easy to use design-paradigms employed here may well be exactly what you’re looking for. So yeah, If you’re into classes with a lot of differentiation-options and nuts and bolts to tinker with, then you may end up rather disappointed by this book. If, however, you’re looking for a book full of classes that are really easy to use and don’t mind the lack of PFU and OA-support, then get this right now, particularly if you don’t already own the constituent pdfs! Now, I won’t lie – for me, as a person, this book managed to score no higher than 3 stars, due to the reasons discussed above. That being said, this was billed as a COMPILATION of sorts, and as a reviewer, I have an obligation to put aside personal bias regarding design-paradigms and how to handle the act of compiling material – I’d have expected updates and more expansions/revisions. And while the book may not be for *me*, I can see some significant appeal for a lot of tables out there. Hence, I need to account for both stances, which brings me to a median rating of 4 stars. The book is not perfect, but quite a few groups will adore content contained within these pages. You can get this tome here on OBS! If you want the print copy, you can find it here at the kobold store! This adventure clocks in at 13 pages, 1 page front and back cover, 1 page editorial/ToC, leaving us with 11 pages of content, so let’s take a look! This review was requested by one of my patreons to be undertaken at my leisure. Now, it should be noted that this, like all modules in the series, manages to cram a significant amount of material into its pages, providing a rather impressive amount of text into the pages. The adventure features a new hazard-concept as well as three new monsters; however, with the exception of one of them, they tie in with the story, and thus will be covered in the SPOILER-section. As before, the series employs the OSRIC-rules and is easily adaptable to other OSR-games (and more current ones). Formatting-wise, it should be noted that spells and magic items have been bolded, and the same goes for monster names and major negative conditions mentioned in the text. This deviation from formatting standards is not exactly something the OCD-guy in me likes, but they’re consistent, so yeah – I can live with that aspect. The adventure is intended for 4 – 6 characters level 6 – 10, though it should be noted that a good mixture of character classes is very much recommended. This is a difficult module, though one that thankfully derives its difficulty mainly from player-skill as well as referee-prowess. In order to discuss this, though, I need to go deep into the SPOILERS. Potential players should jump ahead to the conclusion. So, the eponymous witch-head is an indestructible artifact of pure evil and malevolence – but thankfully, it has been sealed away in a complex dedicated to goodness. But, alas, as is the way of the world, the hero who sealed away the witch-head’s bloodline did not strengthen. Instead, the current duke, Ymis, has to contend with a distant cousin named Dalan, who seeks to abduct his cousin Derica to solidify his claim on the title and overthrow Ymis. While he has managed to secure the dread witch-head, he can’t penetrate the warded estate. This is where the adventurers come in. Basically, the PCs enter a complex designed by the forces of good, which has been overtaken by evil adventurers, with the darkness of the artifact slowly seeping into the designs of the dungeon. This makes the dungeon complex feel really, really unique: In a shrine, the PCs can watch the oscillation of forces of good and evil vie for dominion, with potent buffs and debuffs. The good nature of the complex also is reflected in rooms of purpose – potentially super-deadly trap-rooms that don’t kill smart PCs, courtesy of the good guys obviously including safety measures. These rooms of purpose reward smart PCs and represent one of my favorite aspects herein – the module emphasizes player skill over PC skill with many of the decisions, and smart players will soon realize that separating the actions of the evil pretender’s posse from the architecture of the complex itself will yield them a big advantage. Speaking of which, the outlaws that accompany Dalan are actually 6 fully statted, proper NPCs, with spells prepared noted if applicable. They also have their very own motivations and dynamics and can, in the hands of a capable referee, make for a formidable dynamic encounter to complicate the exploration of the complex. One of the new monsters deserves special mention: The rancid is an otyugh-like, wicked thing that can cause long-time barfing (and thus lock down a careless group fast); it can also cause a really quick wasting disease, which inflicts 2d10 damage per hour…and needs a 14th level caster to cure. There are not many of these things in the dungeon, thankfully, but contracting the disease is pretty much a death sentence for the level. Not a big fan there. The second creature herein would be another somewhat dynamic encounter – a specialized golem that knows the secret doors of the place and looks like a multi-armed minotaur stalks the halls, adding a further complication to the proceedings. My favorite creature here, though, would be the prism ward – basically a pretty harmless, floating crystal that reflects light as super-deadly blasts, acting light a living light amplifier. One of my favorite traps herein is a wand of illumination, wedged in the wall, with a magic mouth (not formatted properly) appearing and speaking the trigger word, aiming at the creature. It’s clever and deadly. Editing and formatting are very good on a formal and rules-language level, I noticed no serious issues. Layout adheres to the no-frills, classic 2-.column b/w-standard of the series and the pdf sports some nice, original b/w-artworks. The cartography of the complex is functional, if not impressive, and unfortunately sports no key-less player-friendly version for VTTs or printing out and cutting up. On the plus-side, the pdf comes fully bookmarked for your convenience. Sometimes, less is more. James C. Boney’s second Advanced Adventure only covers a single dungeon level, as opposed to the Red Mausoleum’s three, but takes it time to properly develop the complex and its inhabitants. The different forces at work in the complex lend it a unique atmosphere, and the inclusion of basically a hostile adventurer group adds some serious spice to the proceedings. I also loved the intentionally anticlimactic BBEG, as this is something that many an author would have shirked away from. That being said, the relative brevity of the module does show a bit. Having a full patrol schedule/AI-like action/response-sequence for the hostile NPCs would have been the icing on the cake. Still, all things considered, this represents a fun and flavorful dungeon with some creative hazards and challenges. My final verdict will clock in at 4 stars. We begin this pdf with a brief introduction to the mechanic and the roles of the class, before diving straight into what we expected – new mechanic tricks! 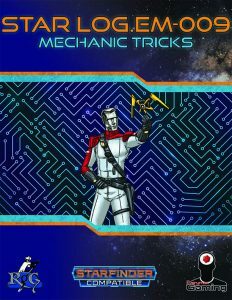 The pdf includes 3 different 2nd level mechanic tricks, the first of which would be Genius Mechanic. While spending at least 24 hours in a settlement, the mechanic may spend 8 hours as well as 50 times mechanic level squared in credits to create a genius mechanic fund. While carrying this fund, you are treated as having +2 bulk. You may, once per day, enact a brilliant plan. This allows you to withdraw from the fund in a 10 minute preparation, withdrawing any technological item or weapon that would have been available in the settlement used to shop for the brilliant plan, detracting its value from the pool. Item you could have crafted in the settlement’s resources may similarly be taken from the fund. The respective item’s bulk may not exceed 2 and the GM is the final arbiter of what works and what doesn’t. In essence, this is a crazy prepared ability, and one that has been improved regarding its verbiage. Precision Demolitionist is amazing: When you attack with weapons with the explode weapon special ability, you may exclude up to 1 + Intelligence modifier (min 0) 5-ft.squares from the explosion – for 1 Resolve, you may double Intelligence modifier for the purpose of how many squares you can exclude. When missing, the ability does not work for the attack. NICE! Ranged Maneuvers lets you choose two combat maneuvers from dirty trick, disarm, reposition, sunder and trip. You may execute the chosen two maneuvers with melee or ranged attack rolls with a small arms weapon, provided the target is within your first range-increment. A further limitation to keep this in line is that the target’s environment needs mechanical devices or computers. The trick also has different synergy effects for drone and exocortex. Like it! The pdf includes 4 8th-level mechanic tricks: Augment Explosive slightly increases the damage output of explosive weapons or armed explosives. Expanded Ranger Maneuvers builds on the previous trick and requires it, unlocking all maneuvers from the list. Explosive Trick is slightly problematic: “Whenever you use the dirty trick or sunder combat maneuver against an opponent…”, you cause an explosion as if you attacked the target with a grenade with an item level equal to your mechanic level and grenade type being chosen by the GM, depending on circumstances. When using dirty trick, you also knock the target prone on a failed save, while sunder adds damage to the targeted object. While the ability needs a 10 minute rest and1 Resolve point to regain a use, I do think that the trick should specify that the dirty trick/sunder attempt actually must hit – RAW, the trick does not require that you actually hit the target. The last 8th level trick is Improved Genius Mechanic, which lets you spend 1 Resolve to enact another genius plan within 24 hours after you have executed the first. I *assume* that this still requires that you have sufficient funds to do so. The pdf also has a single 14th level mechanic trick, Penetrating Demolitionist. When you arm an explosive, you can attempt an Engineering check to assess the structural integrity of every vehicle and object in the explosion radius. The Engineering roll’s result is then compared to the Engineering DC of those. Items and structures are assumed to have a DC of 20, vehicles 15 + 1.5 times the vehicle level. On a success, you detract your mechanic level from the item’s hardness. Thankfully, it does not stack with other DR/hardness/etc.-reducing options and the DC-fixing helps to maintain rules-integrity. The pdf also provides quite a few nice angles regarding the roles of mechanics in the Xa-Osoro system shared by Rogue Genius Games and Everyman Gaming. Editing and formatting are very good on a formal level. On a rules-language level, a few components could be slightly tighter, but as a whole, my complaints boil down to nitpicks. Layout adheres to the ncie two-column full-color standard of the series and the pdf sports a nice artwork. The pdf has no bookmarks, but needs none at this length. Alexander Augunas provides some really cool mechanic tricks, with the explosive-tricks in particularly being rather neat. While the genius plan-sequence of tricks could be a bit tighter, I consider this one to be worth owning. My final verdict will hence clock in at 4 stars. EDIT: The improvements add +0,5 stars, but I still feel like this is closer to rounding down. You can get these mechanic tricks here on OBS! 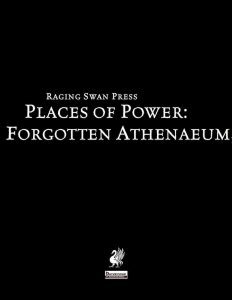 This installment of Raging Swan Press‘ Places of Power-series clocks in at 13 pages, 1 page front cover, 2 pages of advertisements, 1 page editorial/ToC, 1 page SRD, 1 page back cover, leaving us with 7 pages of content, so let’s take a look! 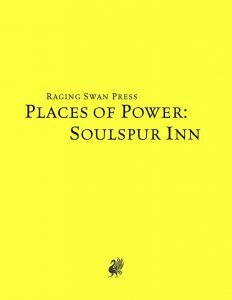 Soulspur Inn has always been there, as far as most folks are concerned – the much-beloved Inn is a sort of neutral ground for adventurers, both regarding legal and moral conflicts. The Inn’s mistress, a woman named Erlgamm, is an epitome of hospitability and oddly, her sharp tongue seems to actually succeed in keeping the tavern a neutral ground of sorts. She is also notorious for her thirst for knowledge, and more than one adventurer has had free drink and food for sharing the latest exploits. Homely and refined, the fully mapped inn is a rather distinguished place and smart players may well find some interesting tidbits regarding the inn and its environments. 6 different whispers and rumours are included for your convenience, and a brief marketplace section allows for the purchase of a variety of low-level alchemical/magical goods as well. Kudos: The marketplace has been properly adjusted to represent old-school sensibilities and items. A table of 20 sample dressings/events allows the GM to generate a sense of life within the Inn, and we learn about the inn being the only commercial business in an otherwise rural, secluded valley. Erlgamm is an important employer and powerful figure in these parts – as such, she actually gets a full NPC-write-up with personality, mannerisms, etc. noted. No stats are provided for her, though. Now, the inn’s write-up sports no less than 6 keyed areas, all but one of which get their own event table. Beyond these, we get read-aloud text for all of the different keyed rooms. Beyond that, there are actual adventure hooks provided for each of the keyed areas, which makes the pdf more immediately useful – basically, they act as a potential means for cluing in the PCs that not everything may be as perfect as it seems. You probably figured it out at this point: Yep, Soulspur Inn is not the haven it purports to be – at least not wholly. The interesting angle here is that the place is very much what it seems to be regarding most aspects – however, there is a second side, all but removed from the proceedings in the inn, and it is not pleasant. That being said, the valley all but requires the inn, so how to handle everything will be an interesting decision, perhaps one that will carry with it a bitter-sweet aftertaste. Editing and formatting are very good, with cosmetic components à la using the word disguise twice in the same sentence being the only level of glitch I noticed. Layout adheres to Raging Swan Press’ two-column b/w-standard. The b/w-artworks are nice, and so is the b/w cartography by Dyson Logos. The pdf comes in two different versions, one optimized for screen use and one for the printer. The pdfs comes fully bookmarked for your convenience. Josh Vogt’s Soulspur Inn is a fun environment that unleashes its full potential when you establish it as a home turf of sorts for the PCs. That being said, the “too good to be true”-component that oozes from it, the slightly uncanny angle, is not exactly new. I maintain that actually NOT having an evil twist would have been the more interesting option here, as the type of narrative provided here is pretty well-represented in gaming. That being said, there is one aspect here that elevates this from being an okay supplement, and this aspect lies in the execution of how the trope is presented – the pdf does a good job at depicting why the inn works as such, why the truth hasn’t surfaced. As written, a GM will have to work a bit to make this play out as intended, courtesy of the pdf not really talking about means to evade detection abilities – but since this is system neutral, I will not penalize it for this. That being said, since this is the system neutral version, I can’t well complain about the mechanics being a bit sparse. Hence, my final verdict will clock in at 4 stars – a well-executed supplement that falls short of excellence, but remains an interesting and worthwhile set-piece. You can get this set-piece here on OBS! 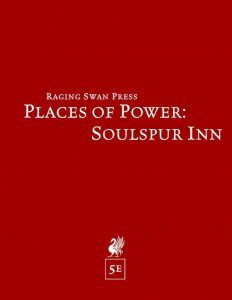 Soulspur Inn has always been there, as far as most folks are concerned – the much-beloved Inn is a sort of neutral ground for adventurers, both regarding legal and moral conflicts. The Inn’s mistress, a woman named Erlgamm, is an epitome of hospitality and oddly, her sharp tongue seems to actually succeed in keeping the tavern a neutral ground of sorts. She is also notorious for her thirst for knowledge, and more than one adventurer has had free drink and food for sharing the latest exploits. Homely and refined, the fully mapped inn is a rather distinguished place and smart players may well find some interesting tidbits regarding the inn and its environments. 6 different whispers and rumours are included for your convenience, and a brief marketplace section allows for the purchase of a variety of low-level alchemical/magical goods as well. These have been properly adapted to 5e, just fyi. The interesting angle here is that the place is very much what it seems to be regarding most aspects – however, there is a second side, all but removed from the proceedings in the inn, and it is not pleasant. That being said, the valley all but requires the inn, so how to handle everything will be an interesting decision, perhaps one that will carry with it a bitter-sweet aftertaste…and one nasty hook pertaining spiced ale is particularly interesting. That being said, this is almost system neutral in that there is e.g. no DC noted for a locked door, no DC to break bars, etc. – this may or may not bother you, but it is worth noting. In 5e, I also found myself expecting a bit more regarding the effects the primary antagonist can unleash – the inn is pretty much the epitome of a lair, and not getting a unique lair action or the like is a bit of a lost chance. Josh Vogt’s Soulspur Inn is a fun environment that unleashes its full potential when you establish it as a home turf of sorts for the PCs. That being said, the “too good to be true”-component that oozes from it, the slightly uncanny angle, is not exactly new. I maintain that actually NOT having an evil twist would have been the more interesting option here, as the type of narrative provided here is pretty well-represented in gaming. That being said, there is one aspect here that elevates this from being an okay supplement, and this aspect lies in the execution of how the trope is presented – the pdf does a good job at depicting why the inn works as such, why the truth hasn’t surfaced. There is, however, also a component here that, well-implemented, could have elevated this further – magic. The issue with this type of narrative lies ultimately in the fact that there are plenty of ways to detect foul shenanigans, and a sidebar of counter-measures or the like, customized for the system, would have significantly enhanced the immediate usefulness of the pdf. As written, a GM will have to work a bit to make this play out as intended and the mechanical aspects are a bit sparse for my taste. Hence, like the PFRPG-version, my final verdict will clock in at 3.5 stars, rounded up due to in dubio pro reo – a well-executed supplement that falls short of excellence, but remains an interesting and worthwhile set-piece.